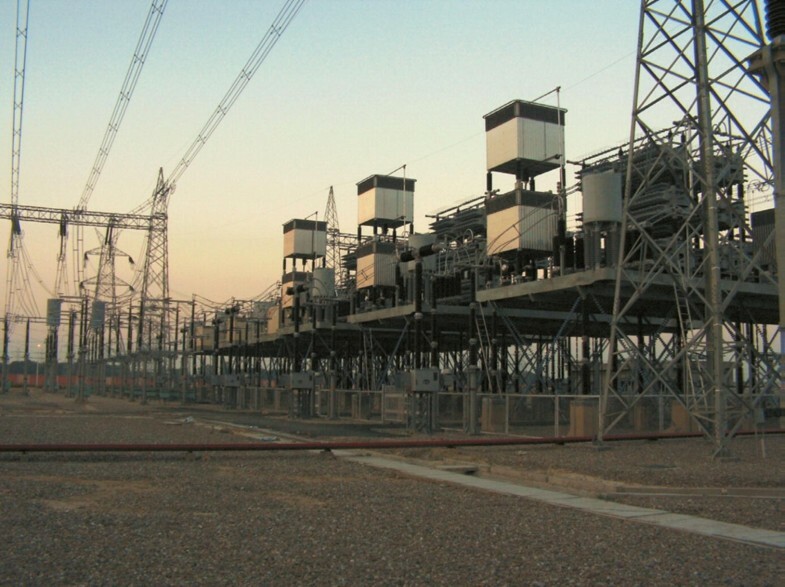 Thyristor switched and controlled series capacitor systems were developed in the late 1980s to enable increased load carrying capacity of existing high voltage transmission lines. Thyristor controlled series capacitors (TCSC) would insert a variable series impedance in a line, which would enable the shifting of loads from lines that were being overloaded to lines that were underutilized. Two TCSC demonstration systems were installed in the USA in the early 1990s. Following the successful demonstration of the technology, 17 thyristor controlled series capacitor (TCSC) systems have been installed in Brazil, India, China, Sweden, and the United Kingdom. All but one of these systems have been built to make high power transmission lines dynamically stable during all foreseen operating conditions. That is, the TCSC systems were used to provide damping of critical power system oscillatory modes and thereby enabled secure operation of the lines. One of the systems was installed only to prevent subsynchronous interactions between a large nuclear reactor and the ac power system. As can be expected, some of the TCSC systems are no longer needed because as the ac power system evolves, the damping of the oscillatory modes improves and the added damping that was provided by the TCSC systems was no longer needed. 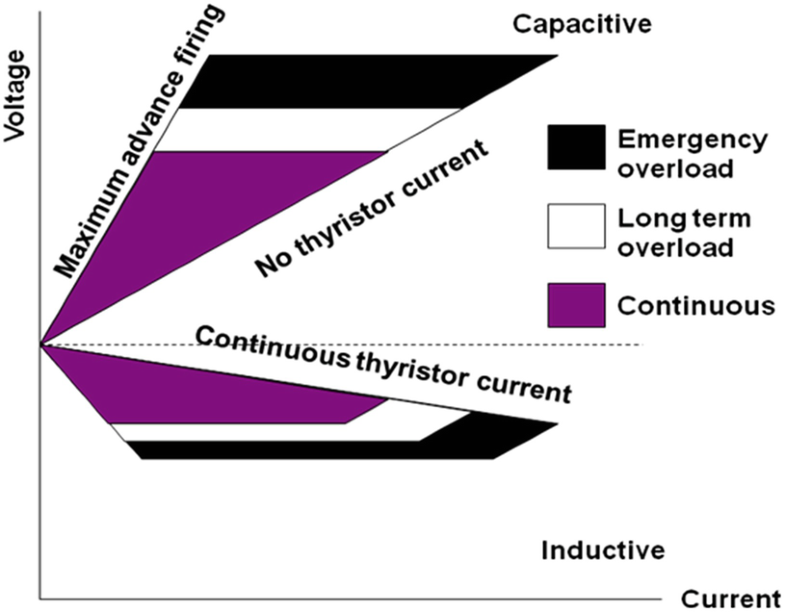 Limitations on power transmission capability in an ac system can be addressed by adding new transmission and/or generation capacity (Ölvegård et al. 1981; Maliszewski et al. 1990). This, however, may not always be practicable, for a variety of reasons. Adding new lines may be too costly and time-consuming. Obtaining new right of way and environmental impact aspects are of much concern, which might also impede construction of new lines. Insertion of capacitors in series with an overhead transmission line is one way to achieve higher power transfer through a long line because the series capacitors reduce the impedance of the line. One of the first major applications of capacitive series compensation was the 400 kV transmission system built in the late 1940s for transfer of power from hydro plants in Northern Sweden to load centers in the middle and Southern parts of the country (Jancke and Åkerstrom 1951). In the 1960s a switched series compensation scheme was applied in the 500 kV Pacific ac Intertie system in the USA to deal with contingencies such as the outage of one of two parallel ac lines used to interconnects power systems between the hydro-based generation along the Columbia river in the Northwest and the power systems located in Northern and Southern California. In this ac intertie, when one line was lost, the compensation of the other line was increased to stabilize the system (Maneatis et al. 1970). This system was also used to increase the power flows across the ac lines in case the HVDC line, which runs in parallel with the ac lines, was lost. At that time, the HVDC line was rated at 1440 MW. The possibility of subsynchronous resonance (SSR) affecting steam turbine generators connected to series capacitor compensated lines was recognized before series compensators were extensively applied (Concordia and Carter 1941). SSR actually occurred in the early 1970s between a generator and series compensated lines in the Southwestern USA (Farmer et al. 1977). This impeded wide spread applications of series capacitors in regions with large steam turbine power plants. However, subsynchronous oscillations can be prevented from arising if sufficient damping of oscillatory modes in the subsynchronous frequency region can be introduced. A potential solution to SSR was demonstrated in the mid-1980s when the NGH Series Compensation Damping System (a thyristor modulated resistor) was tested on a series compensated line in Southern California (Hingorani et al. 1987; CIGRE TB 123 1997). 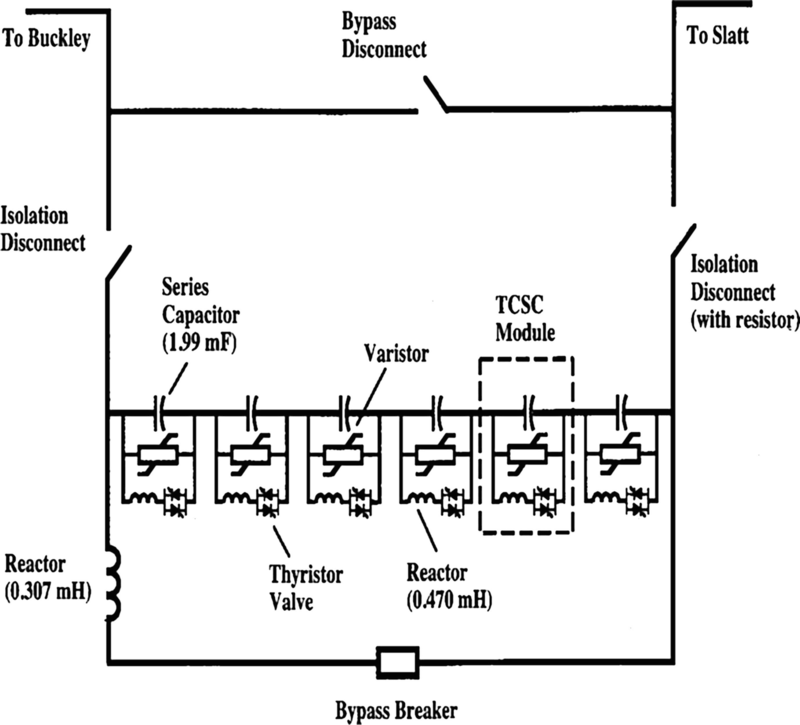 This demonstration indicated that the use of the Thyristor Controlled Series Compensation (TCSC) systems may also have the potential to greatly reduce the risk for SSR (Bowler 1992). Control of power flows in ac transmission lines in which the TCSC system is installed (Ölvegård et al. 1981). The range of control can be enlarged by using multimodular TCSC controllers. Power flows through the TCSC compensated lines can be increased or decreased by modulating the impedance of the TCSC system(s). TCSC systems can be used to augment the power carrying capacity of ac lines in which fixed series compensation systems are installed by increasing the transient and dynamic stability of the line. Within limits, TCSC systems could even enable power flows to be routed from a generating station to a designated power user. The TCSC has been proven to be very robust and effective as a means to improve damping of power oscillations, thereby extending the possibilities for ac power interconnection between two regions by enabling increased synchronizing torque to be transferred between the sending and receiving ends of the lines after a short circuit event. In some respects, the TCSC systems augment the benefits from Power System Stabilizers (PSS) installed in the generating plants, but they can also be used to damp very low frequency oscillatory modes below the control range of PSS systems. 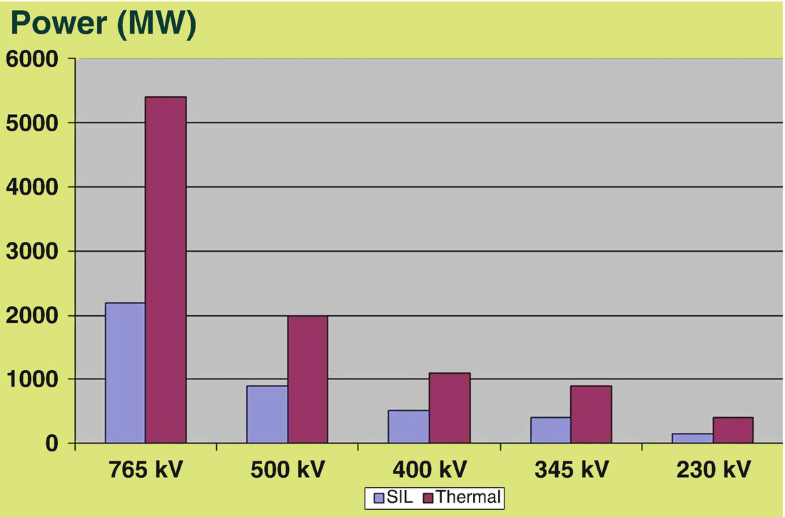 Figure 1 shows typical surge impedance load (SIL) limits for long high voltage power lines versus thermal load limits. Notice that when a transmission line is transmitting its SIL load the reactive power generated and drawn by the line are equal. The thermal limits are typically high because to limit corona losses, multiconductor arrangements are often needed. Furthermore, mechanical forces from ice and wind loading of the conductors often require selection of large, mechanically strong conductors. This leads to relatively high thermal load limits for high voltage lines. In many systems, weaker and thermally limited lines are overloaded while other higher capacity lines are operating far from their thermal limits. This can happen where a high voltage line is overbuilt (in parallel with) a lower voltage line, which leads to underutilization of the higher voltage line. If series capacitors are installed in the higher voltage lines, power can be moved from the overloaded lines which improve the utilization of the investments made in the higher voltage lines as well as improves the efficiency of the power system. However, if the compensated system is disturbed, the weaker lines might be seriously overloaded in the event of the trip of the higher voltage line, which might require fast switching of other elements in the system to avoid cascading faults (EPRI Report EL-6943 1991). TCSC systems can be used to perform such switching. The amount of compensation is easily determined for steady state operation, but the level of compensation inserted in the line often has to be adjusted based on time of day, day of the week, and the season. This requires switched compensation systems. When the dynamics of the system or contingency conditions are considered, the speed of response, the behavior of the system during over and under voltage conditions resulting from disturbances in the system are all important attributes. Other performance characteristics such as the dynamic behavior of the loads also have a big impact on the required compensation. The speed of response of switching operations as well as the duty cycle imposed on switches and connected equipment can make the use of thyristor switched systems advantageous. Many TCSC systems have now been installed worldwide. Some of these are in applications where the systems might become unstable, or the loading of the circuit may have to be reduced for the systems to remain stable, if the TCSC is out of service (CIGRE TB 554 2013). However, in many applications of TCSC and FACTS technologies in general, these systems are only required to operate under contingency conditions. Since the power systems are evolving with new lines and generating stations constantly being added to the systems, many FACTS systems are needed only for a limited time because as the systems become stronger and more interconnected, the contingencies for which the FACTS controller were intended will probably fade away. Still, in all applications of TCSC and other FACTS controllers, the premise is that the transmission system should be operating at least with the same level of reliability and security as before the FACTS systems were installed. Basically this implies that the joint probability for failure of the transmission system and a FACTS controller should be negligibly small (Nilsson 1994). This often puts added emphasis on the design of the control systems for the FACTS controllers. The TCSC system should not be bypassed during an ac system short circuit for faults external to the compensated line, but if bypassing is needed it must recover immediately after the short circuit is cleared. 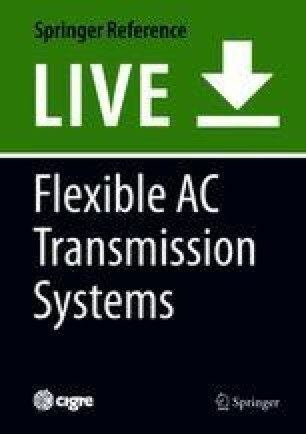 The TCSC system must not fail or be permanently bypassed as a result of an ac system short circuit event. That is, failures requiring by-pass of the TCSC system must be independent events. For these reasons, as is shown in Fig. 2, the TCSC system specifications would normally include a 30 min long term overload rating and a 10 s emergency overload rating. The 30 min overload rating is typically specified for a 35–50% overcurrent and the 10 s rating is typically for 100% overcurrent. However, the 30 min rating is sometimes defined as 150% of the rated power at nominal current or 200% of rated power for 10 s. The long term overload rating is needed to re-dispatch the power flows after some major ac system disturbance and the short term overload rating is to manage the transient power swings during and immediately after an ac system fault. 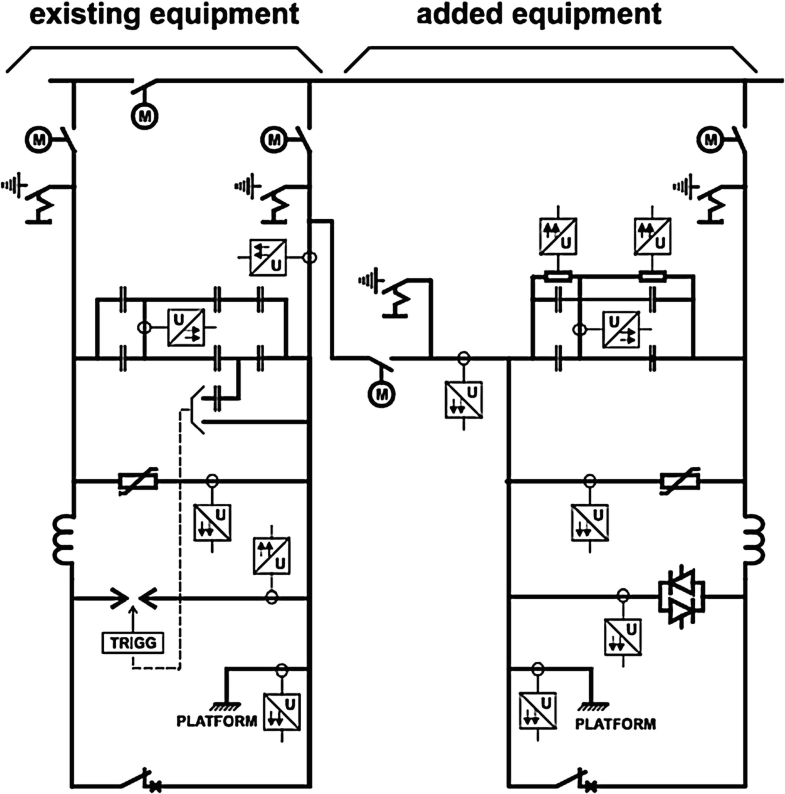 A TCSC system must be able to ride through temporary short circuits on the line in which the TCSC system is installed. The capacitors are assumed to be bypassed by the thyristors during the time it takes for the breakers to clear the fault. When the line is reclosed, the TCSC system must provide maximum reactive compensation to provide the needed synchronizing torque between the two ends of the line. This requires, as described in “Technical Description of Thyristor Controlled Series Capacitors – TCSC,” that the thyristors must be rated for full short circuit current for normal fault clearing. That is, large, powerful thyristors must be used and in addition, an effective cooling system for the semiconductor valves must be installed. In some ac systems, power does not flow through its intended path causing overloads on lines with lower power handling capacity and underutilization of the stronger lines. In such a system, impedance control of key lines using TCSC systems with a large control range could be used to balance the loading of the affected lines. Connecting several series connected TCSC module together is one way to achieve a large control range. By using vernier control in combination with switching in and out of the series connected modules, a large and almost continuous control range can be obtained. In applications where power flow control is the objective, switching of the thyristors at relatively large firing angles (large voltage boosts) will create high, continuous switching stresses for the capacitor modules. This might require special capacitor designs capable of operating continuously with high di/dt stresses. Also, as described in “Technical Description of Thyristor Controlled Series Capacitors – TCSC,” the switching operations will cause harmonic current flows to be circulating through the capacitors, which cause power losses in the capacitors. In situations where a TCSC system is applied to an existing series capacitor installation, the capacitors might have to be replaced if they are not rated for the harmonic currents flows and the high, continuous di/dt stresses. The first 19 TCSC systems installed before the year 2019 are shown in Table 1. However, ABB announced on the 26th of February 2018 that it got an order to install TCSC systems in South Korea ABB 2018 (ABB 2019). Note that in the table FSC denotes Fixed Series Capacitor banks. The first two or three systems listed in Table 1 above were built to demonstrate the capabilities of TCSC systems. The Slatt system in the USA was decommissioned in 2017; 24 years after it was commissioned. It was being used to improve the ac power transfer capability between the Columbia River basin and Los Angeles along the west coast of the USA. The first TCSC installation, shown in Fig. 3, was Western Area Power Administration’s (WAPA) Kayenta system. This system was supplied by Siemens and commissioned in 1992, but the TCSC portion is no longer in service since it was not needed for the operation of the power system but used to demonstrate the functionality of the TCSC technology. Electrically triggered thyristors with gate boxes for firing and monitoring, connected to the control and protection systems by fiber optics. The maximum short circuit current was 6.9 kA and was expected to increase to 7.6 kARMS in the future. It is of interest to note that the one minute rating of the TCSC portion of the bank was 1700 A, whereas the rest of the system is rated at 1500 A. That is, the added duty of the capacitors from the continuous thyristor switching and harmonic current flows were considered in the rating. The Kayenta system was also built for impedance modulation as a series reactor. The reactance at 90° firing angle was about 3.1 Ω inductive. The equivalent reactance could be increased by delaying the firing beyond 90° up to a limit set by the voltage limits of the capacitors and the switch. In this operation mode, the TCSC could be used to buck power flows and as a fault current limiter. 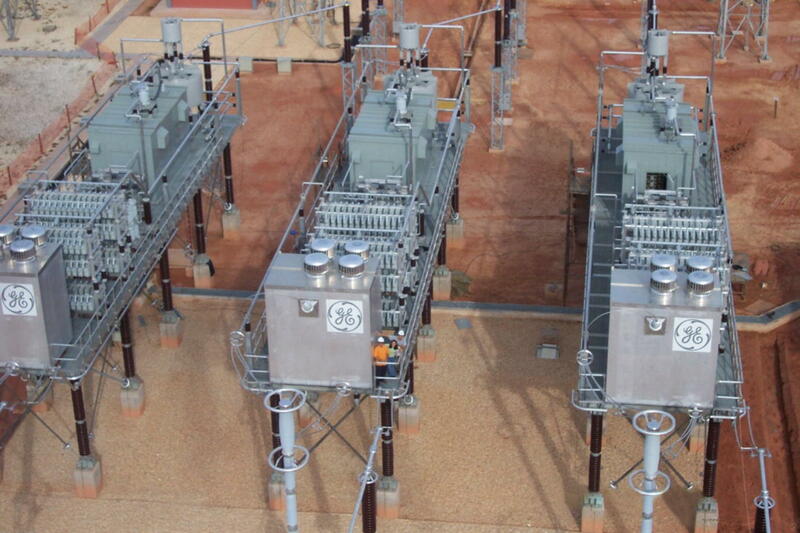 The potential for stimulation of torsional interactions between the installed fixed and series capacitor banks in the Kayenta station was explored through simulations and field tests. It was determined through simulations that the TCSC system would appear to be an inductance in the subsynchronous frequency range. Actual field tests were conducted, which confirmed the simulation results (Hedin 1997). The steady state power loss of the TCSC at a line current of 1,100 A was reported to be 60 kW per phase (Christl et al. 1992). That is, 0.4% of the TCSC rated 45 Mvar capacity. 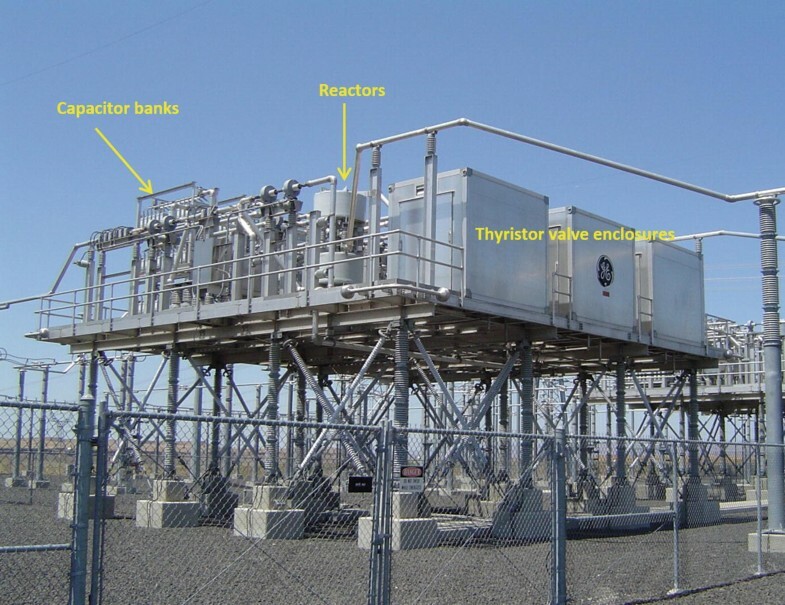 The second TCSC system to be commissioned was the Slatt TCSC jointly developed by the Electric Power Research Institute (EPRI), the Bonneville Power Administration (BPA), and General Electric Company (GE) shown in Fig. 4. The Slatt system was a multimodular TCSC system, whereas all of the other installed systems have been built as single TCSC controllers. As can be seen in Fig. 4, the power electronic subsystems, the reactor for the thyristor switches, and the capacitors are placed on an insulated platform. Not visible in Fig. 4 are the MOV bank used for overvoltage protection of the capacitors and the thyristor switches. Cooling fluids are pumped from ground level up to the thyristor valves. Furthermore, fiber optic links used for thyristor triggering signals and protective functions are also brought up and down the platform through fiber optic links. Water with glycol is used for cooling of the thyristor valves. The cooling pump station and heat exchangers and the control room building are not shown in Fig. 4 either. Because the losses in a TCSC system, as will be discussed below, are at most 1% of the TCSC’s rating, the cooling system plant and heat exchangers are relatively small. Also, the TCSC controls moderately increase the space needed for the normal FSC control and protections systems. 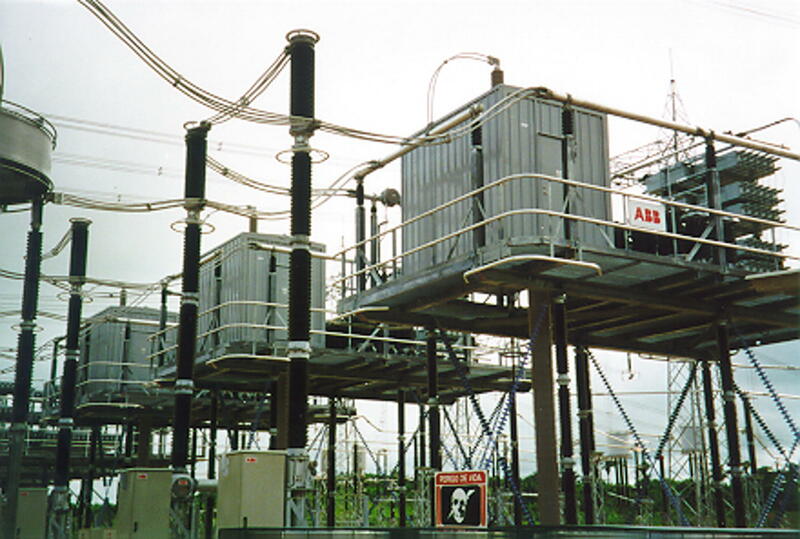 This system was installed at the BPA’s Slatt substation in Oregon and put into operation in 1993 but was decommissioned after 24 years of service since it was no longer needed. A simplified schematic diagram of the multimodular Slatt TCSC system is shown in Fig. 5. The major differences between the Slatt and the Kayenta systems are found in the short circuit current duties, modularity, and voltage ratings. Slatt was installed in a high short circuit capacity 500 kV system (20.3 kARMS; maximum crest fault current equal to 60 kA). It was an 8 Ω bank, rated 2900 A, divided into six modules of 1.33 Ω each. However, the continuous rating with the thyristors operating was 9.2 Ω or 1.53 Ω per module. The 30-min current rating was 1.5 p.u. and the 10-s current rating was 2 p.u. The 30-minute impedance rating at 1.0 p.u. current was 12 Ω and the 10-s rating also at 1.0 p.u. current was 16 Ω. A protective by-pass of the capacitors was ordered if the current reached 10.7 kA. The reasoning behind this specification was that maximum compensation of the line was needed to maintain transient stability of two systems during the first swing of the disturbed system. This is when the current will be the highest. Also, by dividing the TCSC in several series segment, the control range approximates a continuous function from a small inductive impedance (not used in the Slatt system except the characteristic impedance of the Slatt TCSC system is equal to a small inductance when the thyristors are fully conducting) to full capacitive compensation when all modules were inserted with maximum vernier control. This minimized the installed capacitance of the system (Urbanek et al. 1992). 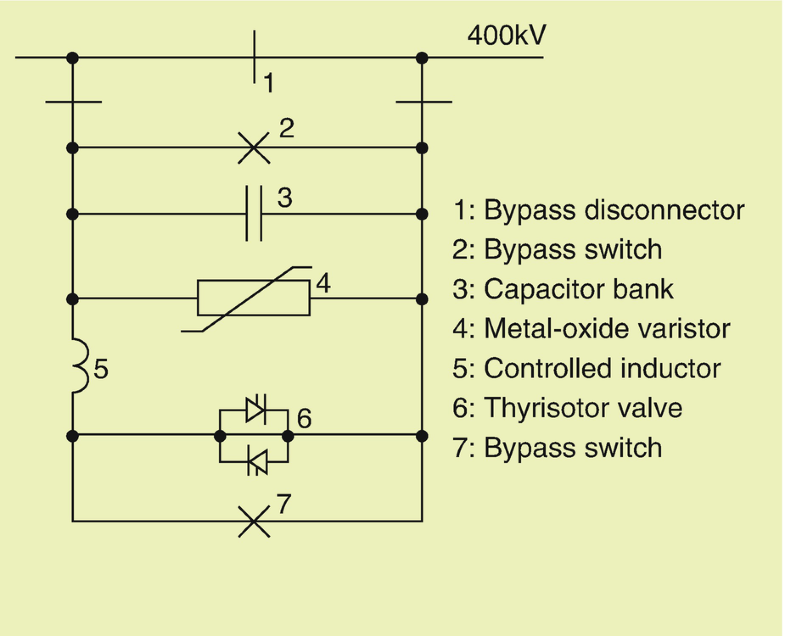 A new thyristor device was developed for the TCSC application. The device was a 3300 V, 100 mm diameter, with a special gate structure to achieve high di/dt performance. Also, the device was relatively thin to minimize the forward voltage drop, which was slightly below 1.4 V at 4,000 A. This enabled the devices to ride through the high short circuit currents associated with the Slatt site. The significant di/dt duty imposed on the thyristor was overcome by the special gate structure and emitter shorts were introduced to allow the devices to withstand high dv/dt stresses without causing the device to turn on. (McDonald et al. 1994). In the Slatt TCSC system, the gate drivers were powered from current transformers (CTs) placed in series with the TCSC modules plus voltage transformers (VTs) across the modules. One consequence of this choice was that the gate drivers would not contain sufficient energy to turn on the thyristor devices at low line currents. A weak thyristor gate pulse leads to poor current spreading in the thyristors and a high probability for device failures. Therefore, the TCSC modules would be blocked if the line current fell below about 600 A. The bypass switch would be closed if the blocking condition existed for several seconds. Insertion of the TCSC modules was enabled if the current was slightly higher than the blocking level. The high minimum current would be of some concern in a general application of a TCSC system because when the TCSC is bypassed, it will not be able to add any damping of potential torsional interactions caused by the fixed series capacitors. Gate driver power from the ground through isolation transformers or light triggered thyristors with integrated voltage-break-over features can be used to lower the low-current operating limit. 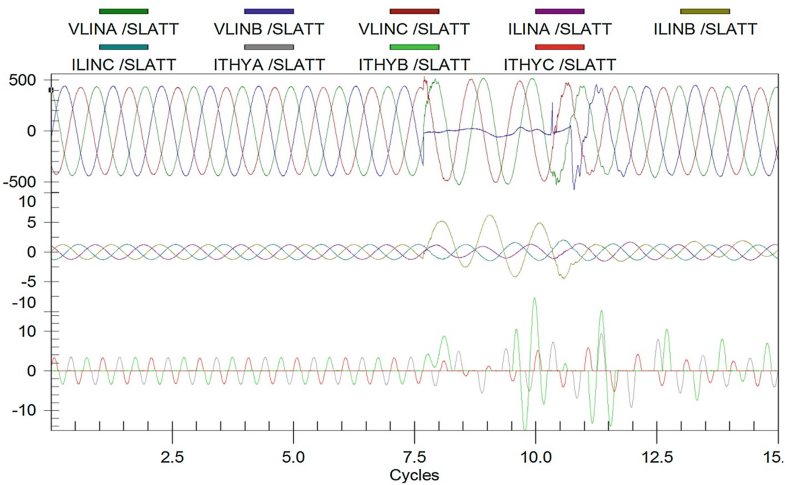 Slatt was equipped with control features for system damping and transient stability improvements as well as for SSR damping (Venkatasubramanian, and Taylor 2000; Urbanek et al. 1993). All of the functions were tested in staged tests to the degree this was possible before putting the system into commercial operation early 1995 (Piwko et al. 1994). Staged fault tests were probably the most severe for the TCSC equipment itself because faults on the line side of the TCSC puts the 500 kV bus voltages across the bank. Very steep front surges were impressed upon the thyristors. Although a few thyristors were reported to have failed in these tests, the performance was remarkably good (Kinney et al. 1997; Hauer et al. 1996; Piwko et al. 1996). A step change from 1.1 to 1.7 pu was accomplished in about 1 cycle. The TCSC system appeared to be the same as an uncompensated system (inductive characteristic) if two of the six modules were operated with a boost factor of 1.5 pu. Power oscillation damping and numerous three phase and single phase (stuck breaker) fault cases were also simulated. The tests showed that the TCSC would provide positive damping for the ac system and that the thyristor firing control implementation was robust. The chosen location provided very high short circuit currents. This required large metal oxide varistor (MOV) banks with many parallel MOV columns, which is typical for modern series capacitor banks. 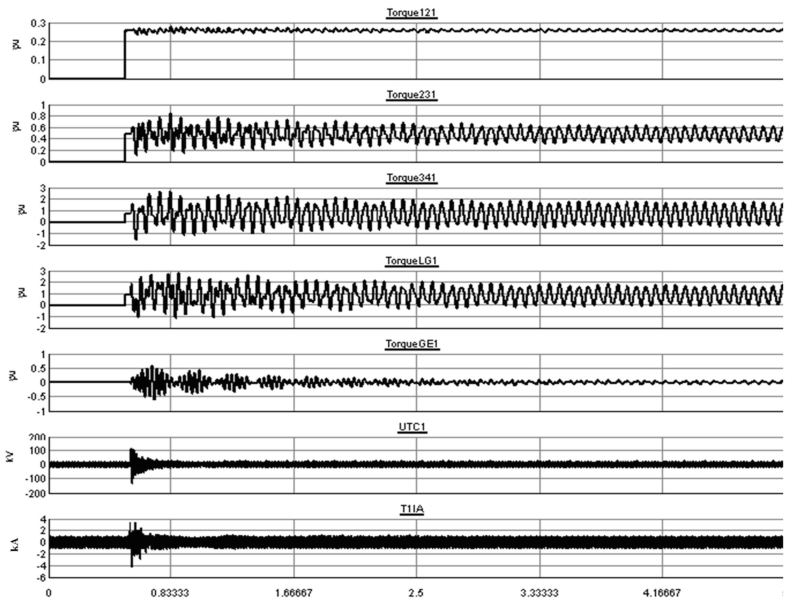 Several staged fault tests were conducted (Kinney et al. 1997). Both faults on the line and station side of the TCSC and faults on another 500 kV line connected to the Slatt bus were tested. Figure 6 shows the relay record captured during the test of a bus side single phase to ground fault on the B-phase. The peak short circuit current that flowed through the TCSC system was about 6 kARMS. A few thyristors failed during this test, although not because of the high fault currents but likely because of weak gate pulses after the fault had been cleared. The harmonic content of the line currents before and during the commissioning tests were also measured. It was found that there was no significant difference between the harmonic current content before the TCSC was put into operation and with the TCSC system in operation. The chosen installation site also facilitated demonstration of the SSR damping features. This feature was tested by connecting the Slatt TCSC system radially to a local steam turbine generator (Hauer et al. 1996, 1997). 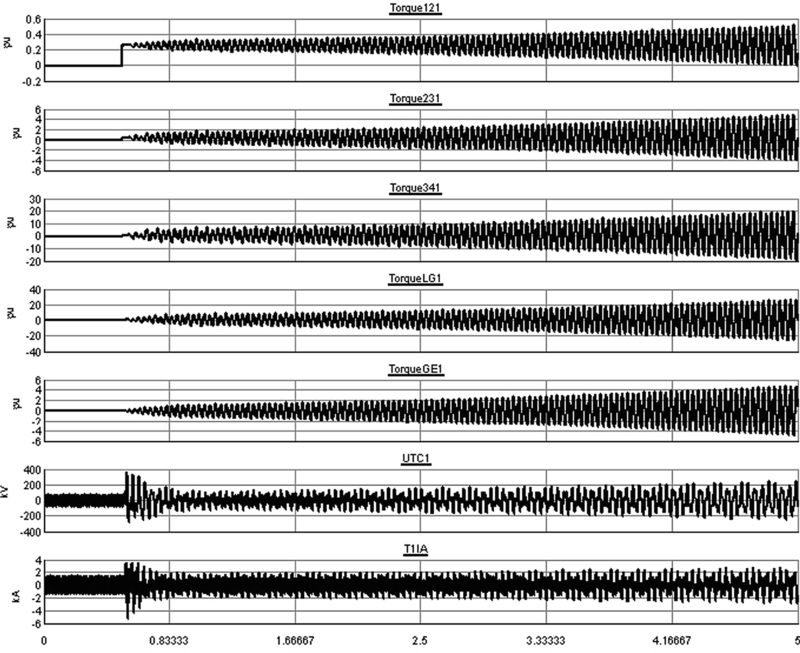 The tests demonstrated that the Slatt TCSC system was decoupled from the generator shaft’s torsional interaction (TI) modes when operating in the vernier control mode. That is, the shaft modes were not damped but not amplified either when connected to the Slatt TCSC. This was the expected result based on the earlier simulator tests (Nyak et al. 1994). No active SSR damping was included in the control system so this result was positive proof that the Slatt TCSC system by itself did not cause SSR. The chosen test site also had direct economic benefits since it enabled increased power transfers on the 500 kV lines between the northern and southern ends of the 500 kV Pacific AC Intertie transmission systems along the Pacific Coast in the USA. The performance of the Slatt system was evaluated as shown in Table 2 (CIGRE TB 554, 2013). How was the performance of the system being evaluated? Is the transient performance meeting expectations? Any unexpected or unforeseen events occurred for which the TCSC system was not responding correctly? Were the observed deviations severe requiring retuning of the controls or of no consequence? Problem was resolved and operation continues with one module blocked; that is only 5 of the 6 modules were used in the vernier control mode. Have staged faults been performed to validate the design of the system? The Slatt TCSC system was unique in that it enabled the change of the line impedance almost continuously within a large range because this TCSC system was built using six smaller, series connected thyristor switching modules. That is, the system was built to enable a transmission system operator to change the power flows in an ac transmission system between lines that cannot carry as much power to lines that can carry higher loads. In this way, the transmission line losses might be minimized by moving the power to lines with better power handling capability. By doing this, lines that would be overloaded can be off-loaded, which should enable the power distribution in a power system to be optimized. This application did not require this capability, but it is a feature that could be highly useful in existing, built-out power systems in which new power plants are installed in places where such a plant was never before envisioned. The Slatt test system demonstrated this capability. It also showed that if there were a slight difference between conduction periods of the thyristor valves between the positive and negative half cycles, a small dc component would arise with consequences similar to the effects of geomagnetically induced currents (GIC). The solution was to use one of the six, small series capacitor modules as a fixed capacitor. The published total losses for the Slatt TCSC system would be highest if the system was operated in the maximum possible inductive operating mode (Larsen et al. 1994). At this operating point, the power loss of the TCSC system was about 0.6% of the TCSC’s rating. The total loss when the TCSC is conducting in the bypass mode (with the capacitors short circuited by the thyristor branch) with the line current at 1 pu was about 0.4%. The maximum losses in the capacitive vernier mode occurred at the highest boost factor with a current slightly less than 0.5 pu. This was also reported to be about 0.4%. The losses are less at higher and lower line currents, because the Slatt system was designed as a multimodule TCSC with six series modules, and some of these modules could be bypassed and other modules could be operated with varying boost levels. The anticipated need for extensive use of power flow controllers in the USA never materialized largely as a result of the deregulation of the power systems. Therefore, no new TCSC systems have been installed in the USA. The Brazilian Interconnected Power System (BIPS) is a large hydro-thermo-wind system, with a predominance of hydroelectric power plants and multiple owners. The BIPS consists of four subsystems: South, Southeast/Midwest, Northeast, and most of the North of Brazil. The BIPS’s total generation capacity installed is 155,528 MW (2017). It encompasses 154,748 km of transmission lines, divided into 22,132 km of dc lines (600 and 800 kV) and 132,616 km of ac lines (230, 345, 440, 500, and 750 kV). Figure 7 shows an overview of the BIPS that is characterized by long ac and dc transmission lines. The dc transmission lines (Madeira River and Belo Monte Projects) are longer than 2,000 km. Regarding the ac lines, the 500 kV corridors are long and most of them are equipped with series capacitors. In 1999 the first 500 kV ac transmission line was installed connecting Imperatriz substation (Maranhão State) and Serra da Mesa substation (Goiás State). These series compensated lines, which can be seen in Fig. 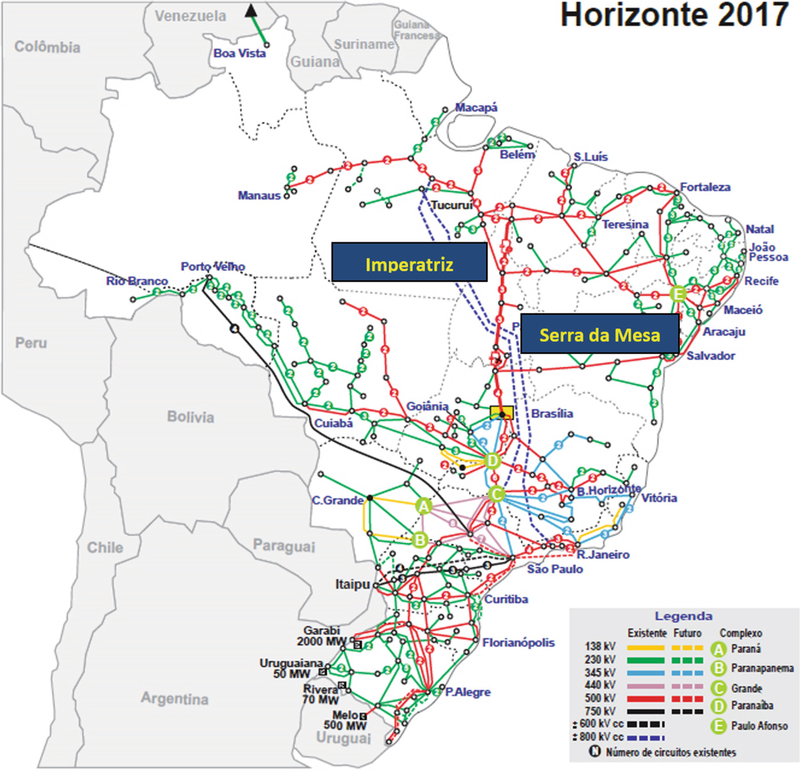 7, show the BIPS interconnections between the North/Northeast and South/Southeast/Midwest areas in Brazil. Figure 8 shows a one line diagram of the Imperatriz to Serra da Mesa with six FSC systems and shunt reactors for voltage control and Fig. 9 provides a more detailed view of the relevant part of the Brazilian power system. Two TCSC systems were included in the design of the line, one in Imperatriz substation and another in the Serra da Mesa substation. The TCSC systems were vital parts in the expansion of the ac power system in Brazil (Ping et al. 1996; Machado et al. 2004). These TCSC systems were used to provide damping of the 0.2 Hz electromechanical oscillations of the North-South interarea mode. Following the completion of a second North/Southeast 500 kV ac interconnection, two more TCSCs were installed in these stations increasing the number of TCSC system from two to four. The transient stability was not an issue when the first 500 kV North-South interconnection ac circuit was built due to the level of fixed series capacitors installed along this interconnection. However, system damping needed to be addressed. Therefore, TCSC systems were installed in this line. The Serra da Mesa TCSC was installed in the 500 kV North-South interconnection in Brazil to damp power oscillations (Gama et al. 1998). The Serra da Mesa circuit #1 TCSC, a single line diagram of which is shown in Fig. 10, comprised a 13.25 Ω series capacitor in parallel with a 2.07 Ω TCR reactor (CIGRE TB 544 2013). The main goal for the TCSC was to damp power oscillations in the 500 kV North-South interconnection in Brazil. During the commissioning work in 1999, it was set up for damping a 0.20 Hz power oscillations interarea mode. When the second 500 kV ac circuit of the North-South interconnection was added, the interarea mode changed to 0.30 Hz and the TCSC was re-tuned to this frequency. With the expansion of the North/Southeast interconnection and because of further reinforcements (third interconnection circuit in 2009) in the receiver subsystems that occurred during subsequent years, the electric distance between the generation centers of the North/Northeast and Southeast/Midwest subsystems was reduced, causing an increased frequency of the characteristic oscillation mode to between 0.35 Hz and 0.4 Hz. In 2015 the TCSCs at Serra da Mesa were converted into FSCs since the damping of the interarea modes was no longer as critical as when only two circuits were available, but the installed TCSC systems enabled power transfers from North to South and vice versa for about 16 years. This supports one of the tenets for installation of FACTS controllers, which is that FACTS is an enabling technology of significant benefit when installed in a growing power system. The TCSC operated in steady state as a fixed series capacitor, with an effective capacitive reactance of 15.92 Ω (1.20 times its physical series capacitor). Therefore, in steady state it just added synchronizing torque to the North-South interconnection. The vernier control of the TCSC ranged from 6% to 15% of transmission line reactance, i.e., from 13.25 to 39.81 Ω, providing controllable reactance to counteract power oscillations (interarea mode). For high magnitude oscillation conditions, the TCSC was designed to buck the power flow through the TCR (2.46 Ω inductive), i.e., the reactor bypasses the series capacitor. The TCSC had the same intrinsic protection as regular series capacitors. In addition, it was equipped with valve and valve-based electronic supervision and protection of the thyristors plus conventional protection for the TCR reactor. The TCSC was equipped with MOV surge arresters as the main protection against series capacitor overvoltages. The TCSC was designed to withstand short circuit current within certain limits. In the event of a short circuit, the MOV arrester starts conducting to protect the series capacitor against overvoltages. The protection strategy for the TCSC was to bypass it for any short circuit or ground fault on the TCSC equipped line and reinsert it after the line is reclosed. The bypass of the TCSC’s series capacitor would be performed by the TCR. This means that the power damping function could be re-enabled immediately after the end of the short circuit current flows. In the event of severe internal line faults when the MOV arrester would be close to having reached its energy/current limits, a spark gap would be triggered to bypass the TCSC. The spark gap would bypass the series capacitor, the reactor, and the MOV to provide thermal protection of the TCSC. In the same way as described for Serra da Mesa TCSC, the Imperatriz TCSC was installed in the 500 kV North-South interconnection in Brazil to damp power oscillations. The Imperatriz circuit #1 TCSC comprises a 13.27Ω series capacitor in parallel with a 2.11 Ω TCR reactor, for the purpose of providing damping of power system oscillations. The same retuning in the control (from 0.20 to 0.30 Hz) as for the Serra da Mesa TCSC was performed after the integration of the second circuit of the North-South interconnection. This TCSC acts in steady state in the same way as is described above for Serra da Mesa circuit #1 TCSC. Figure 11 shows a photo of the Imperatriz TCSC installed at Imperatriz 500 kV substation in Northern Brazil. The design of the Imperatriz TCSC is similar to the Serra da Mesa TCSC The vernier control of this TCSC ranges from 6% to 15% of the transmission line reactance, i.e., from 13.25 to 39.81 Ω, providing controllable reactance to counteract power oscillations (interarea mode). It was designed to have the TCR in continuous firing mode in such a way as to operate as an inductive stable reactance (2.52 Ω) bypassing the series capacitor when using the TCR mode. The Serra da Mesa TCSC installed in the second circuit of the North-South interconnection in Brazil was also designed to damp power oscillations. 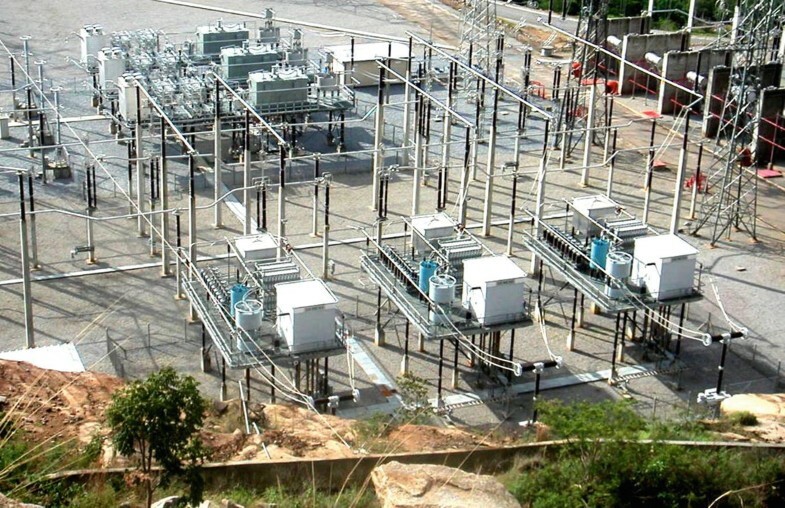 Figure 12 shows a photo of the two retired TCSCs in the Serra da Mesa substation. These TCSC systems were not as critical to the operation of the system as the TCSCs installed in circuit #1 described previously, since the interarea mode increased from 0.20 Hz to 0.30 Hz when the second circuit of North-South interconnection was finished. The actions of the Imperatriz TCSC in the North-South circuit #2 in Brazil were similar to those of the Serra da Mesa TCSC installed in the same circuit, at the remote terminal. These TCSC systems played an important role in keeping the system stable under severe contingency conditions, e.g., an outage of the 500 kV North-Northeast interconnection. The degree of fixed series compensation along the North-South circuit #2 was enough to keep the transient stability under control. Figure 13 shows a photo of the Imperatriz TCSC installed at Imperatriz 500 kV substation in Northern Brazil. Imperatriz and Serra da Mesa circuit #2 TCSCs comprise a 13.27 Ω series capacitor in parallel with a 2.20 Ω TCR reactor and were also installed for the purpose of damping power oscillations in the 500 kV North-South interconnection in Brazil. During the commissioning work in 2004, they were set up for damping of the 0.30 Hz power oscillation interarea mode, with the integration of the 500 kV North-South second circuit. With three circuits in operation, the North-South interconnection developed an interarea mode around 0.35 Hz and these TCSCs were retuned to this frequency. The transient stability was not an issue at the time of the second circuit operation due to the level of fixed series capacitors installed along the North-South interconnection. In the same way as for the circuit #1 TCSCs, these TCSCs acted in steady state as fixed series capacitors since they have an effective capacitive reactance of 15.92 Ω (1.20 times their physical series capacitors). Therefore, in steady state these TCSCs just added synchronizing torque to the North-South interconnection. Similarly to circuit #1, the vernier control of these TCSCs ranged from 6% up to 15% of transmission line reactance, i.e., from 15.92 to 39.81 Ω, which provided a controllable reactance to counteract power oscillations in the North-South interconnection. In other respects, the designs of the Imperatriz and Serra da Mesa circuit #2 TCSCs were similar to those of the TCSCs installed in circuits #1. 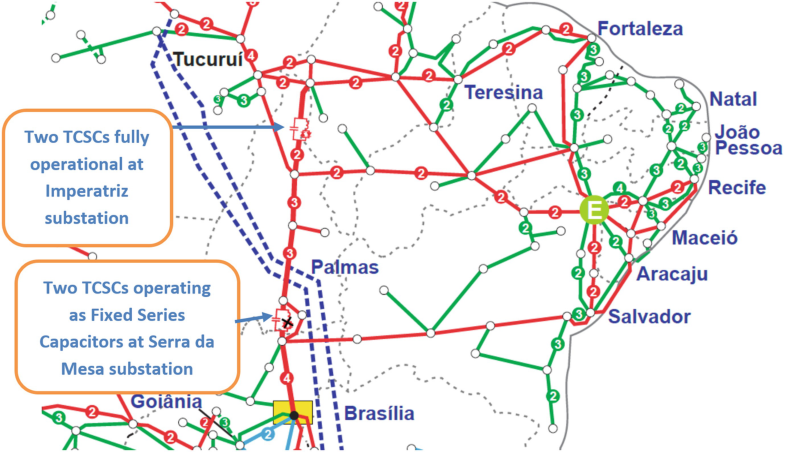 Simulations carried out on the performance of the TCSCs, specifically those installed in the Serra da Mesa substation, identified that if the Serra da Mesa TCSCs were providing dynamic modulation of the line impedance, there would be a loss of selectivity of the out of step protection installed on the North Southeast interconnection, with the possibility of reducing their sensitivity in situations where they would be needed. Furthermore, it was found that the performance of the TCSCs could compromise the effectiveness of a new Special Protective Scheme (SPS) based on the out of step protection of the 500 kV Gurupi - Serra da Mesa circuit #1 installed at the Gurupi terminal. The SPS action is used to send a signal to disconnect four generating units in the Tucuruí hydro power plant to avoid the loss of synchronism in case of events that cause large generation deficits in the Southeastern, Midwestern, or Southern regions. The loss of one of the Madeira River HVDC Bipoles is among those events. To avoid the discovered problems, and to retain the gains obtained with the implementation of the new SPS, the Brazilian System Operator, ONS, recommended that from March 2015 and onward, the operation of the TCSCs installed at the Serra da Mesa substation be operated as a fixed series capacitor, with a nominal value of the series capacitor, i.e., 13.25 and 13.27 Ω, respectively, for TCSC 1 and 2. Therefore, the two TCSCs at Serra da Mesa substation are presently running as fixed series capacitors. The two TCSCs installed at the Imperatriz substation in the North remain in operation as TCSCs with active damping control function. A further analysis during the integration studies of the ±800 kV, Xingu-Estreito HVDC bipole showed that this bipole can provide adequate damping, through a power oscillation damping (POD) control function for the interarea mode (North-South) even with the Imperatriz TCSCs operating as fixed series capacitors. However, if the Xingu-Estreito bipole is lost, the BIPS loses its capability of damping the interarea mode. Therefore, when the ±800 kV, Xingu-Terminal Rio HVDC bipole comes into operation (foreseen for 2019), the Imperatriz TCSCs will be converted into series capacitor banks and the 800 kV HVDC bipoles will be responsible for damping the North-South interarea mode. The Swedish power system is a part of the synchronous Nordic Power System which includes Sweden, Finland, Norway, and eastern part of Denmark. The annual energy consumption in Sweden at around year 2010 was about 140 TWh and the installed production capacity was about 35 GW. The main consumption areas are situated in the southern part of the country. The majority of the energy in 2010 was generated by hydro and nuclear plants (hydro 45%, nuclear 50%). Hydro power plants are situated mostly in the northern part of the country and nuclear power plants in the coastal areas of southern Sweden. As is shown in Fig. 14, as of 2010 eight 400 kV lines connected the hydro power plants in the north with the large load areas in the south. Each line is up to 500 km long and series compensated up to 70%. Two new series capacitors (SC) were installed on the 400 kV ac-interconnections between Sweden and Finland. 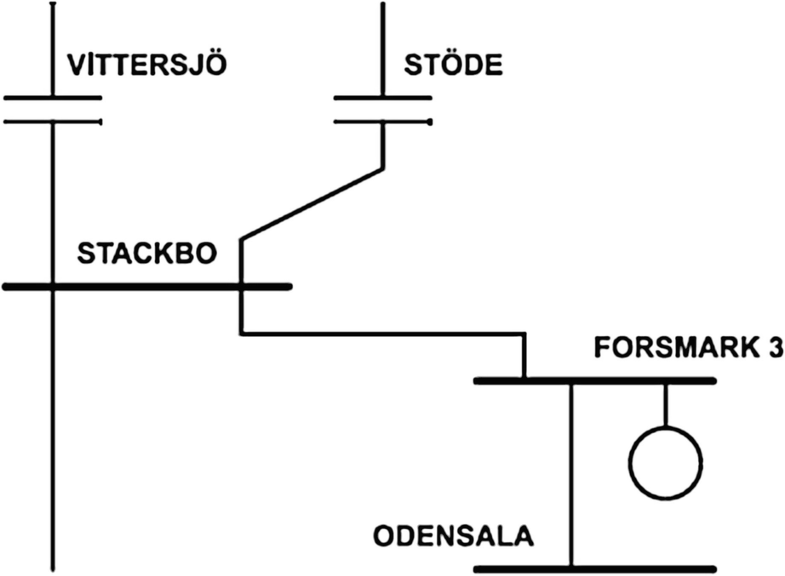 Two of the eight lines, the ones comprising the series capacitors in Vittersjö and Stöde, are installed in the 400 kV lines directly connected to Forsmark, a major nuclear power plant. One of the units, Forsmark 3, has a production capacity of about 1150 MWe. This unit was equipped with a subsynchronous resonance (SSR) armature current relay that would detect if subsynchronous current exceeded a predetermined level for a specified time. The relay had three current levels, the first being an alarm level and the other ones causing generator trip after different time delays. The FSC systems at Vittersjö and Stöde both had relay protections which would detect subsynchronous current. The relay protection would automatically bypass the series capacitor whenever a certain SSR current amplitude and time criterion was exceeded. The Stöde FSC was erected in 1974 using capacitors impregnated with PCB. In the early 1990s the installation was completely refurbished with state-of-the-art components including non-PCB capacitors. The station was recommissioned in November 1994. Shortly after the Stöde FSC was put into service the subsynchronous current relay at Forsmark 3 started to trigger repeatedly and the series capacitors were bypassed several times. A study was conducted to examine how to prevent the subsynchronous resonance (Agrawal and Farmer 1978). The system close to the nuclear power plant at Forsmark is shown in Fig. 15. One way to prevent subsynchronous resonance would have been to eliminate part of the series compensation in Vittersjö. This measure would move the electrical resonance in the network away from the critical frequency. But if more than one third of the reactance in Vittersjö FSC was eliminated, a new resonance would appear at the critical frequency, now caused by the Stöde FSC. This illustrates the problem of two series capacitors with different reactance connected at the same busbar near a power plant. The reactance at Vittersjö at fundamental frequency was 50 Ω and in Stöde 73 Ω. The reduction by one third of the Vittersjö FSC’s capacitive reactance would also have changed the power flow in one critical bottleneck in the Swedish network and reduced its power transfer capacity. This solution would also have increased the power losses in the system. Another more attractive solution was to install a TCSC that would change the reactance in the subsynchronous frequency range even when the capacitive reactance at fundamental frequency, i.e., 50 Hz, remains constant. It was, therefore, decided to install a TCSC in Stöde. This was done by dividing the existing series capacitor into two segments. One segment, 70% of the original series capacitor, remained as a conventional FSC and the other segment became a TCSC. The section that was rebuilt is 30% of the total installed reactance. The series capacitor thus equipped was commissioned in 1997. Figure 16 shows a single-line diagram of the Stöde TCSC and Fig. 17 shows a simplified block diagram of the its control system. An inner control loop (SVR – Synchronous Voltage Reversal) that takes a pulse train as input and then calculates the thyristor trigger instant so that the capacitor voltage zero-crossing occurs with a constant time delay with respect to the input pulses. The loop uses instantaneous values of measured line current (IL-meas) and capacitor voltage (UC-meas) as inputs for calculating the trigger instant. It has been shown that the apparent impedance should ideally be inductive in the subsynchronous frequency range when the dynamic response of the PLL and the boost controller is slow. The characteristic is independent of the boost level and the line current amplitude. The only purpose of the Stöde installation was to avoid the SSR conditions for the generator in the Forsmark #3 unit. Therefore, the control system operated with constant boost reference, i.e., the apparent reactance divided by the physical reactance at fundamental frequency was controlled and the ratio (XTCSC,app / XTCSC,phys) at 50 Hz was constant. A design change was made to one phase of the TCSC system because spare light triggered thyristors became unavailable. The new thyristors were electrically triggered. The control system was, however, left unchanged (Ängquist et al. 1996). Because of ac system expansions in the region, the TCSC system is no longer needed for SSR damping. The FSC banks also installed at Stöde is planned to be rebuilt in 2019 at which time the Stöde TCSC will be converted to a fixed capacitor bank. The first 500 kV TCSC in China was installed and put into operation in the Pingguo substation by China Southern Grid in July 2003. This grid, shown in Fig. 18, is a very complex ac/dc interconnected power system which includes the Hong Kong grid and covers five provinces in South China. The increasing demand for electric power in the southern provinces of China requires extension of the HV power grid. Bulk power is transferred to load center via long-distance ac and HVDC transmission lines. At the sending end of China Southern Grid, there are several power stations and ac and dc lines, resulting in wide differences in system operation modes. Local oscillation modes and interarea low frequency oscillation modes exist in China Southern Grid due to long distance bulk power transmission. In case of heavy power flow through the mid- and south-corridors, interarea and weakly damped low frequency oscillation modes would arise after network disturbances. The usual way to mitigate and eliminate these low frequency power oscillations is to install PSS on some generator exciters. But for a very complex system, such as China Southern Grid where multiple oscillation modes exist and operation modes vary considerably, it is difficult to design the PSSs for system damping because the PSSs are expected to not only mitigate multiple oscillatory modes but also adapt to variable operating modes of the generators. Studies showed that installing the TCSC in the tie-line was the best way to damp the interarea power oscillations. 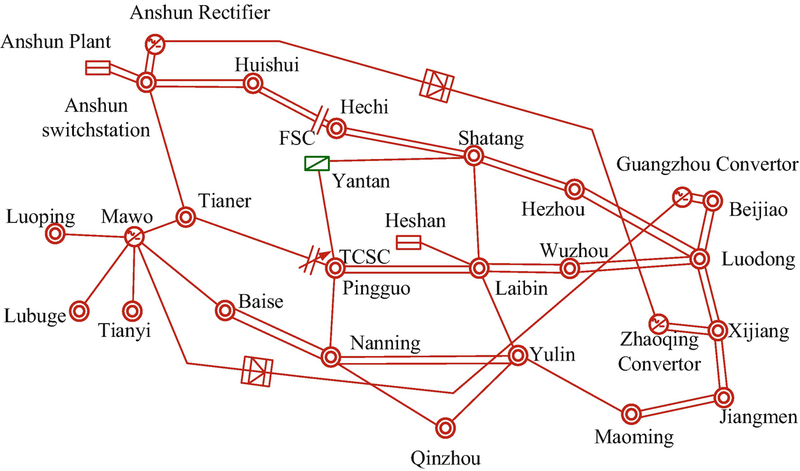 The mid-corridor from West to East is the main oscillatory path in the China Southern Grid. Therefore, a TCSC was installed in the West to East transmission corridor to damp interarea power oscillations. The chosen place for the installation of the TCSC was the Pingguo substation, which lies in the middle of the corridor, because this would provide the most effective mitigation of the interarea oscillation modes. The Pingguo TCSC and the Hechi FSC are part of this west-to-east network improvement. Their locations were carefully selected, and together with the Tian Guang and the Gui-Guang HVDC links contribute to improved system reliability for the benefit of consumers. The transmission capacity from West to East in China Southern Grid was increased by about 160 to 240 MW with the Pingguo TCSC and by about 400 to 500 MW with both the Pingguo TCSC and the Hechi FSC. 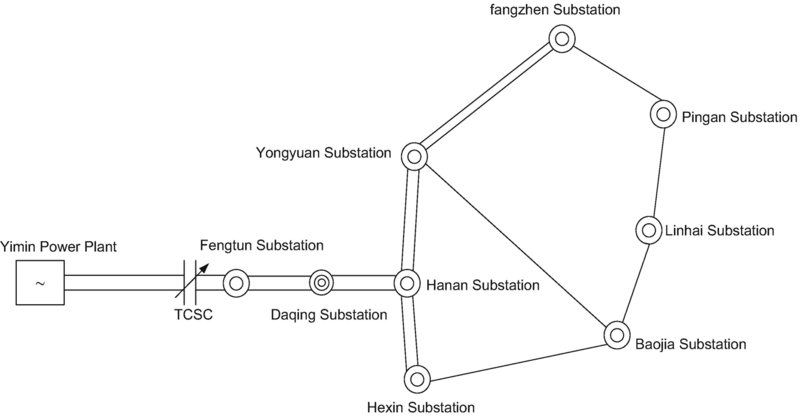 The TCSC located at Pingguo substation comprises a TCSC segment with a FSC segment on one single platform per phase. The installed FSC is rated at 35%, and the installed TCSC is rated at 5% compensation of the Tianshengqiao-Pingguo line. The Tianshengqiao is a hydro-electric power plant located at the sending end of the Mawo to Guangzhou HVDC line that is shown in Fig. 18. In steady state the TCSC acts as a fixed series capacitor, since it has an effective capacitive reactance of 4.57 Ω (1.1 times its physical series capacitor), but the apparent impedance of the TCSC at subsynchronous frequencies is inductive (Fan and Quan 2005). For power oscillation damping (POD), the TCSC is used to modulate the effective reactance of the power lines by control of the boost factor. During power oscillation, the inserted TCSC reactance can be changed between 12.45 Ω capacitive, corresponding to a boost factor of 3.0, and 4.15 Ω capacitive, corresponding to a boost factor of 1.0 (thyristors blocked). With the thyristors bypassed, the inserted TCSC reactance is changed to 0.784 Ω. By suitable system control, this modulation of reactance counteracts the oscillation of active power, thereby quickly damping it out. For external faults, the TCSC is protected by the installed MOV without bypassing the capacitor. In case of internal faults, the capacitor is bypassed by a gap and locked out by a circuit breaker. The controlled segment uses the fast thyristor bypass feature to immediately protect the capacitor and the MOV when the equipment is overloaded. For the FSC segment, an MOV and gap protected series capacitor scheme has been found to be the most economical solution that meets all ac-system fault requirements. The TCSC segment is realized according to thyristor protection schemes (TPSC) in case of internal faults. The single line diagram comprising the main TCSC components is shown in Fig. 19. For the FSC in series with the TCSC the capacitive reactance is 29.2 ohms corresponding to 109 μF. The nominal continuous current for the capacitor banks is 2000 ARMS, with temporary overload currents up to 3000 ARMS for 10 min. The resulting steady state 3-phase reactive power is 350 Mvar. The TCSC segment is permanently operating at 4.57 ohm in controlled mode. This results in additional 5.5% line impedance compensation. At lower firing angles, the TCSC will be able to increase its capacitive impedance up to 12.45 ohm. Within that range, the TCSC impedance could be continuously adjusted depending on the line current. The TCSC system is equipped with a damping circuit as shown in Fig. 19 with performance as described in Table 3. 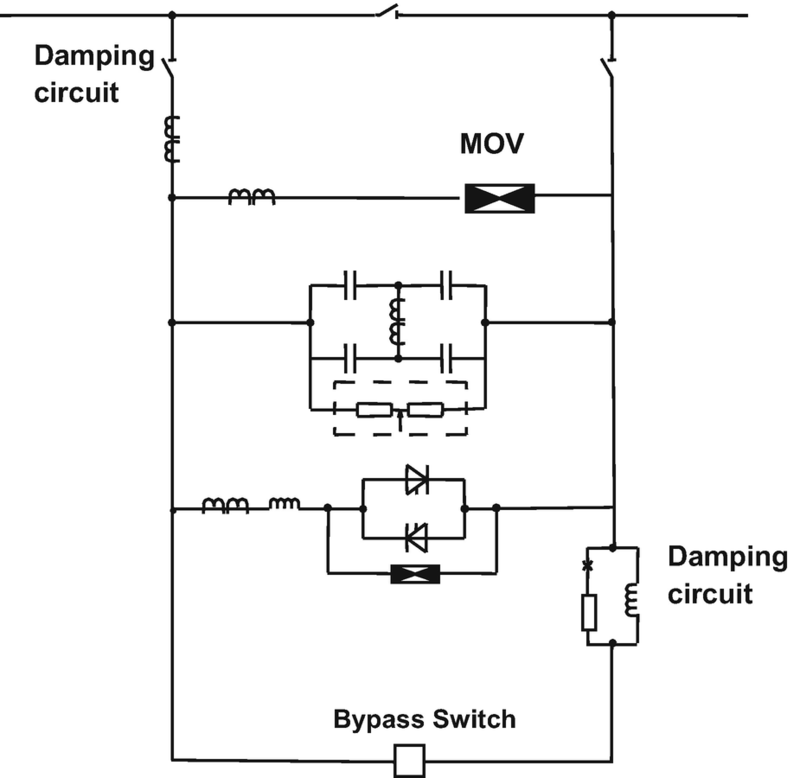 The purpose of this damping circuit is to limit the current magnitude and frequency of the oscillations arising when the capacitor is discharged by closing the bypass breaker. During normal operation of the capacitor bank, no ac line current flows through the bypass-reactor of the damping circuit because a small air gap in series with the damping resistor was inserted to block the voltage during steady state operation and to flash over only when the capacitor bank needs to be discharged. The components of the bypass circuit were designed for a continuous current not less than the nominal bank current and the short circuit current of the line. Additionally, the components of the bypass circuit were designed to withstand the transient stresses associated with short circuiting the capacitor under the most severe network condition. The assumption for this was two internal faults occurring within a short time period. 3.4.2 Chengxian, Gansu Electric Power Co. Ltd. The first TCSC controller developed independently in China was put into operation in Chengxian substation of Gansu Provincial Grid on December 27, 2007. The main purpose of the project was to avoid a dynamic instability between a hydro plant and the power system. The Longnan zone of Gansu province has an abundance of hydro resources with a maximum output of the Bikou hydro plant at 356.6 MW. As shown in Fig. 20, the Bikou hydro plant is connected to the Chengxian 330 kV substation via a single 140 km long 220 kV transmission line. The Chengxian 330 kV substation is interconnected to the Gansu provincial grid via a single 120 km long 330 kV transmission line. A low frequency power oscillation existed in the power system before the TCSC was installed. Furthermore, according to the stability analysis, the transmission capability of the Bikou-Chengxian 220 kV line was transient stability limited to 235 MW, which was less than the maximum transmission requirement of the Bikou plant during high power flow periods. Moreover, the Bikou-Chengxian line goes through a mountainous region, so that it would be very expensive to build a second transmission line and a large forest would be ruined. Therefore, the TCSC technology was studied as a means to eliminate the Bikou transmission bottle-neck. The analysis indicated that a 50% TCSC scheme would be economical. The scheme could satisfy the maximum transmission requirement of the Bikou plant during high flow periods, because the transient stability limited transmission capacity of the Bikou-Chengxian 220 kV line would then be increased from 235 MW to 345 MW, and the low frequency oscillation between the Bikou plant and the main grid would be effectively suppressed. 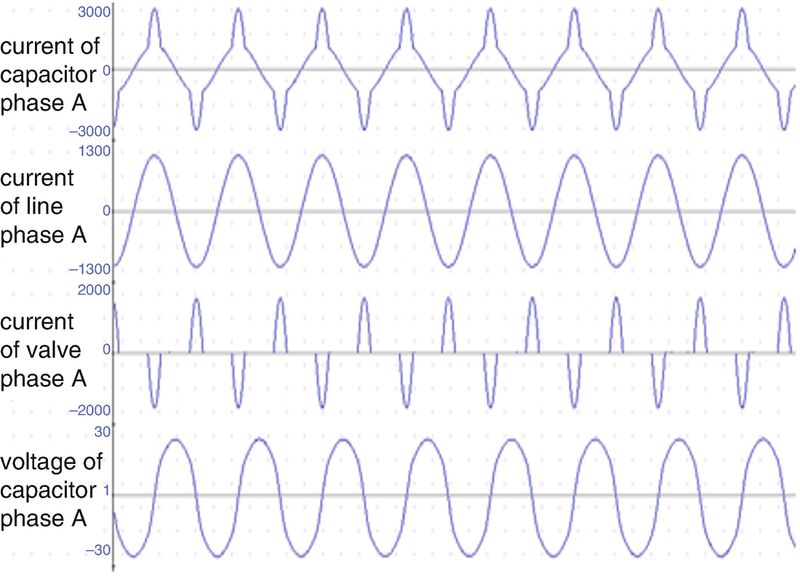 In steady state this TCSC, shown in Fig. 21, would act as a fixed series capacitor, with an effective capacitive reactance of 23.9 Ω (1.1 times its physical series capacitor). The vernier control of this TCSC ranges from 21.7 Ω (1.0 p.u.) to 54.3 Ω (2.5 p.u.) providing controllable reactance to counteract power oscillations (local mode). 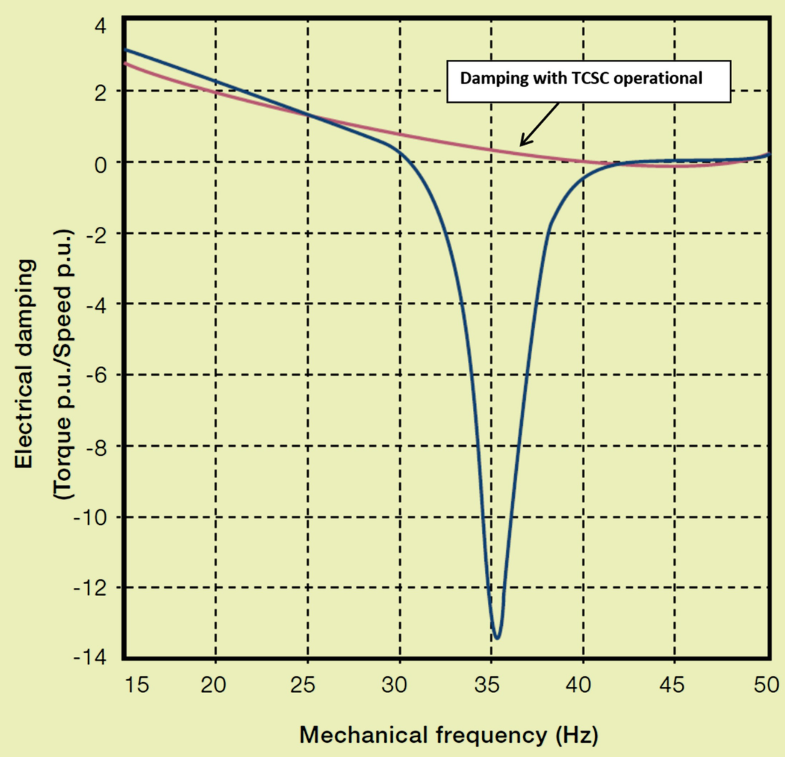 The TCSC impedance is 3.45 Ω inductive in the TCR mode when the series capacitor is bypassed. 3.4.3 Fengtun, Northeast China Grid Co. Ltd.
A TCSC system was installed in the Fengtun substation of State Grid of China, which is at the end of the northeastern power system in the Hulunbeier region of eastern Inner Mongolia, China. The Yimin Power Plant in the Northeast power system originally had two 500 MW thermal power generators. In 2007, two additional 600 MW thermal power generators were installed. That brought the total generating capacity up to 2200 MW. The Yimin Power Plant was connected to the 500 kV Fengtun substation through two 500 kV ac lines as shown in Fig. 22, and the total length of the 500 kV transmission lines from Yimin to Fengtun was 378 km. The transient stability limit of the two ac lines was only about 1600 MW. Therefore, the power capacity of the double circuit transmission lines was not sufficient to transfer the full output from the Yimin Power Plant. To develop a new transmission line between Yimin Power Plant and Fengtun substation would require building a long distance ac line across the sensitive forest areas. This plan was not feasible from the perspective of environmental protection and economy. Therefore, in order to increase the power transmission capability of the lines, improve the transient stability of the power system, and suppress any subsynchronous resonance that may arise in the power system, the State Grid Corporation of China (SGCC) decided to install 500 kV TCSC systems on the two 500 kV power lines between Yimin and Fengtun. 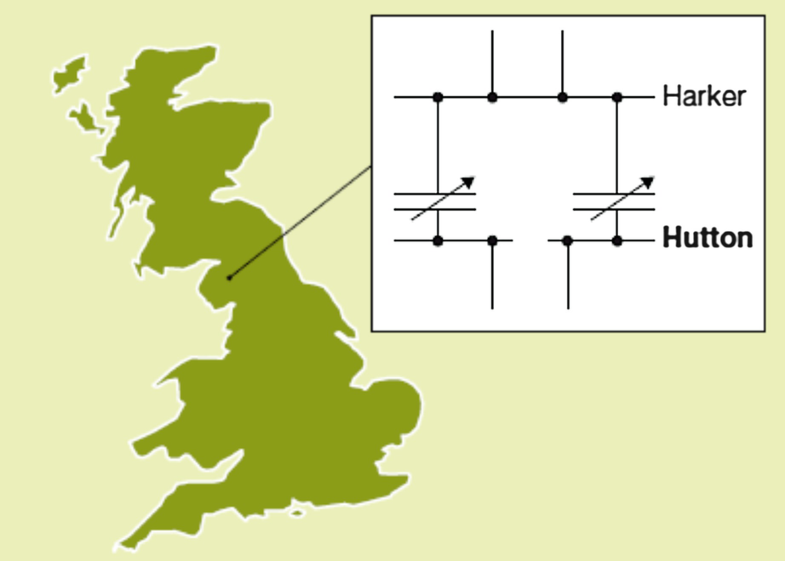 The location of the controller in the 500 kV power system is shown in Fig. 23. Each of the two TCSC devices in the Fengtun substation is rated at 326.6 Mvar. That is, the two together are rated at 753.2 Mvar. The TCSC system was developed by the China Electric Power Research Institute, which was also the supplier of all other equipment for the TCSC project. The control and protection system contain completely independent dual units and can be used for compensation of the individual phases to remove phase unbalance. The TCSC measurement system uses a hybrid optical-electrical measurement technology. The power supply of the high-voltage measurement system is combined with laser energy transmission and line energy acquirement, which greatly improves the reliability of the system measurement and operation. A fully enclosed pure water cooling system, circulating high-purity water with ethylene glycol mixed liquid to prevent freezing of the fluid during the cold winter of the regions of northern China and improve the cooling efficiency of the controller. The main over voltage protection of the series capacitor bank is a large-capacity metal oxide voltage limiter (MOV), and the guaranteed MOV current nonuniformity between parallel MOV columns at the protection level does not exceed 5%, which ensures the overvoltage protection reliability of the series capacitor. The spark GAP is a sealed structure with a two-electrode ignition feature, which makes the discharge voltage stable and the polarity effect minimized. The installation of the device and the system commissioning work were completed in July 2007. The TCSC system was officially put into operation in October 2007 and has been operating well. The TCSCs in the Fengtun substation were installed in the 500 kV transmission line from Yimin to Fengtun. 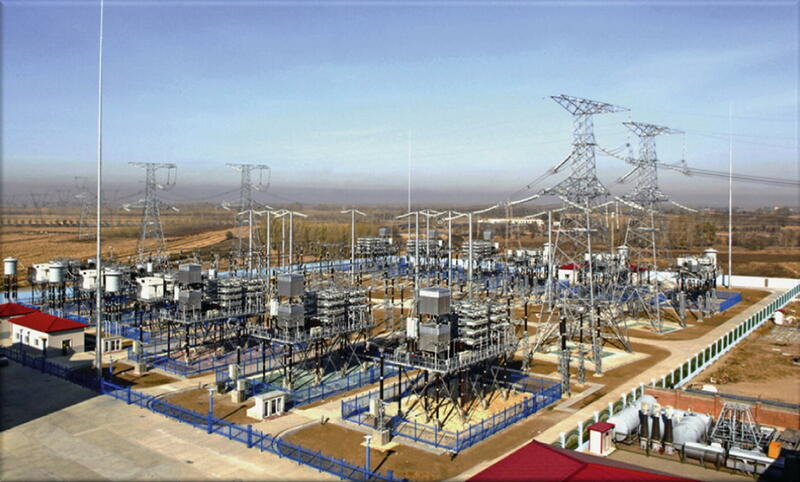 The Fengtun substation lies 20 km northeast of Qiqihar in Heilongjiang Province, China, with an average altitude of 146 m and a minimum temperature of −39.5°C. As shown in Fig. 24, the 15% rated TCSC system in the Fengtun substation was combined with a 30% FSC. The main equipment includes series capacitors, metal oxide voltage limiter (MOV), and current limit damping circuit, spark gap (GAP), thyristor valves (liquid cooling system) and phase control reactor, bypass circuit breaker and disconnect switches, measurement and monitoring systems, control and protection systems, etc. 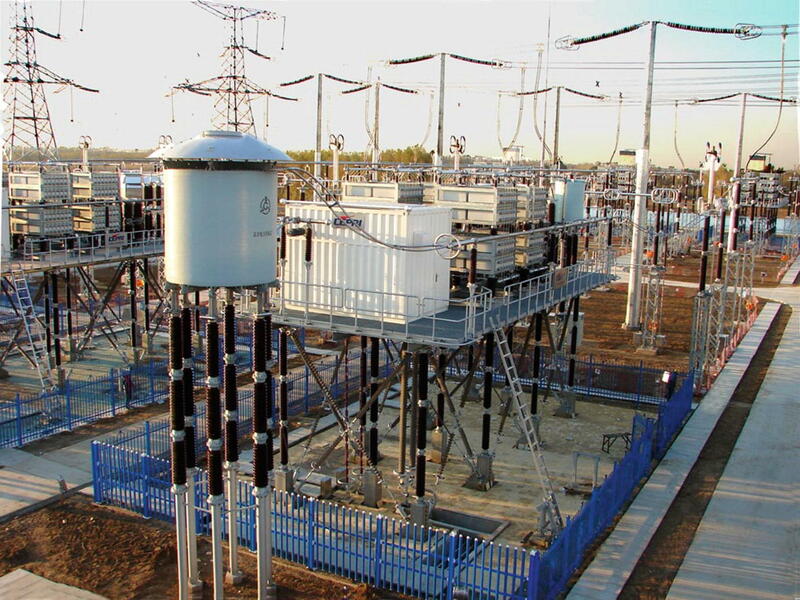 In October 2007, the 500 kV TCSCs in the Fengtun Substation were put into operation. The electrical data for the TCSCs is provided in Table 4. The TCSC thyristor valves are cooled by de-ionized water mixed with glycol. 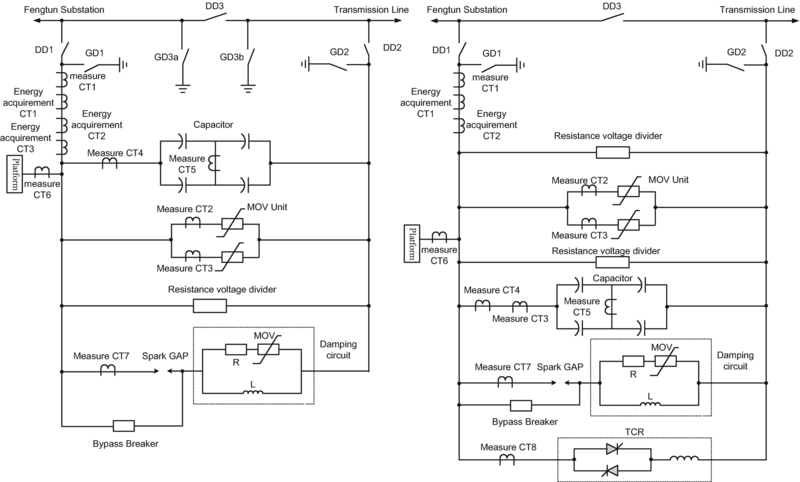 The key parameters for the Fengtun TCSC thyristors are shown in Table 5. Figure 25 shows an aerial view of the two TCSCs and the FSC banks installed at the Fengtun 500 kV substation. Figure 26 shows a close-up view of the TCSC systems. Real Time Digital Simulation (RTDS) tests were conducted to assess the expected performance of the Fengtun TCSC. This included power oscillation damping (POD) and SSR tests. The POD function is an important part of the control strategy for the TCSC. Figure 27 shows the predicted low frequency power flow oscillations on the line with and without the POD function in the TCSC. Subsynchronous oscillations (SSO) arise from energy flowing between the series capacitor of FSC and the steam turbine generators. 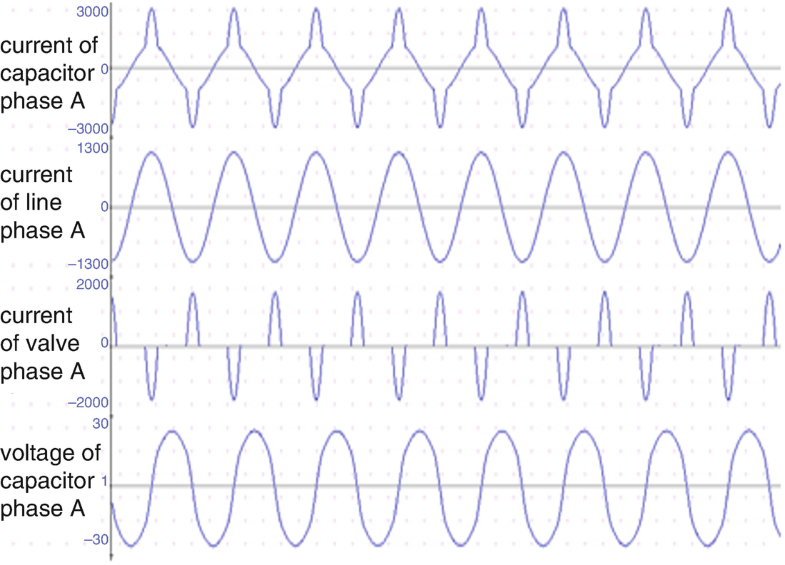 The TCSC enables suppression of these oscillations. Figures 28 and 29 show RTDS simulations of the performance of the power system with only the FSC and with the TCSC+FSC combination. As can be seen in Fig. 29, it is obvious that the SSO is suppressed by the TCSC. Ch1 is the torque between the hi-pressure turbine and the medium pressure turbine of the 1# turbine in the Yimin power plant. Ch2 is the torque between the medium pressure turbine and the low-pressure turbine A of the 1# turbine. Ch3 is torque between the low-pressure turbine A and the low-pressure turbine B of the 1# turbine. Ch4 is the torque between the low-pressure turbine B of the 1# turbine and the generator. Ch5 is the torque between the generator and the excitation generator. The control and protection system for the 500 kV TCSCs in the Fengtun Substation consists of two completely independent digital systems, which can switch on/off the bypass breaker, bypass disconnector, series disconnector, and grounding switch of the TCSC device, regulate the firing angle of the thyristor valves, and provide protection for the system. The TCSC control and protection system is designed to detect all fault states during the operation of the system and when necessary to activate the relevant trip relays to isolate or remove the fault effectively in a timely manner. This function ensures the safe and stable operation of the TCSC. Its design is coordinated with the transmission line protection systems to protect other devices in the power system. There are four main types of protection for the TCSC system: MOV overvoltage protection, capacitor protection, platform protection, and thyristor valve protection (CIGRE 123 1997). A series of field tests were carried out during commissioning of the 500 kV Fengtun TCSC. These included functional tests of the steady state and dynamic characteristics of the TCSC system. 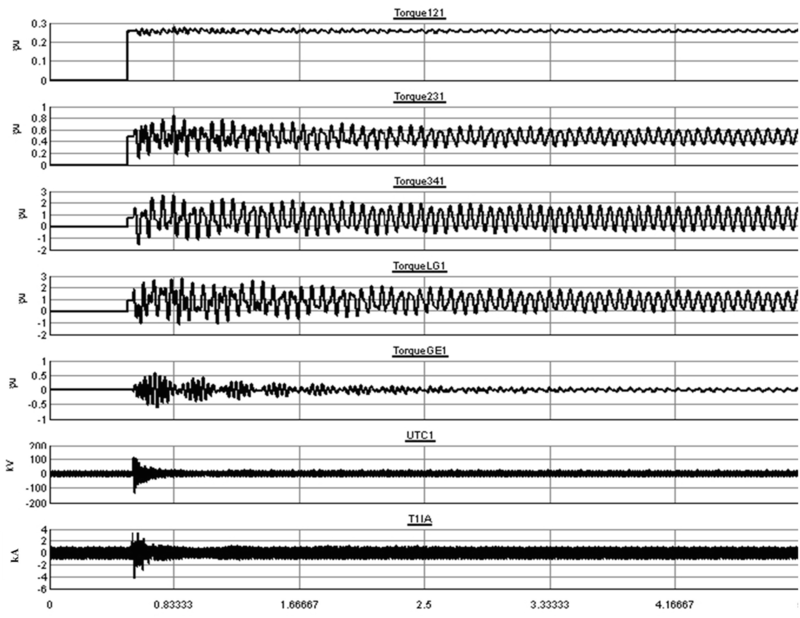 The recorded waveforms of TCSC in normal operation are shown in Fig. 30, The current waveforms of the capacitor, the line, and the valve c as well as the capacitor voltage are shown in Fig. 30. The action of the control and protection of the 500 kV TCSC in the Fengtun substation was tested by staging an earth fault. The single-phase ground fault was placed on the line side of the TCSC and FSC on phase C. The line is equipped with single pole trip reclose breakers. That is, only the phase C breaker poles were opened as a result of the fault. Since the single-phase earth fault test took place in C-phase, the currents of MOV1, MOV2 and spark GAP of phase A and B were always zero. As can be seen in Fig. 31, the currents of MOV1 and MOV2 of phase C were pulsed waveforms, which indicated that both MOV voltage limiters had protected the series capacitors from over-voltage. 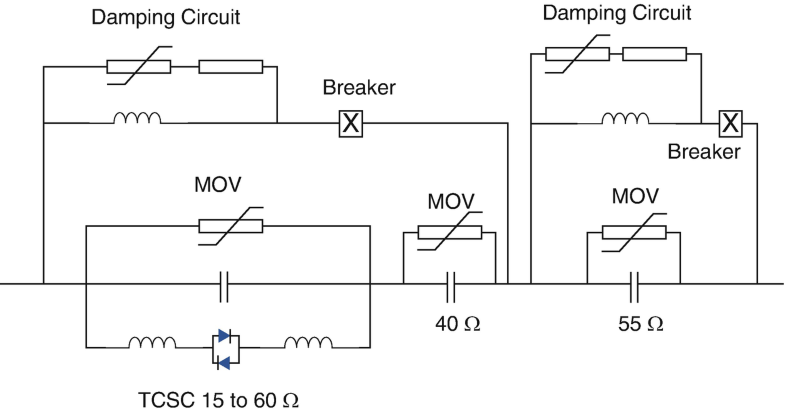 When the TCSC control and protection system determined that a high level short-circuit fault occurred, it immediately issued a C-phase spark GAP trigger signals, which extinguished the currents through the MOV1 and MOV2 of the C-phase. After the bypass breaker was closed, the C-phase spark GAP current returned to zero. After the C-phase short circuit occurred, the C-phase thyristor valve bypassed the series capacitor bank to limit the short circuit current and then was blocked. As can be seen in Fig. 31 Currents through the MOVs for the FSC and the TCSC and the spark gap current of phase C.
Figures 32, 33, 34, and 35, during this period, the A- and B-phase thyristor valves were first blocked and then immediately were forced to maximum impedance to increase the transmission power through the line. The line to ground voltages on the line can be seen in Fig. 36. 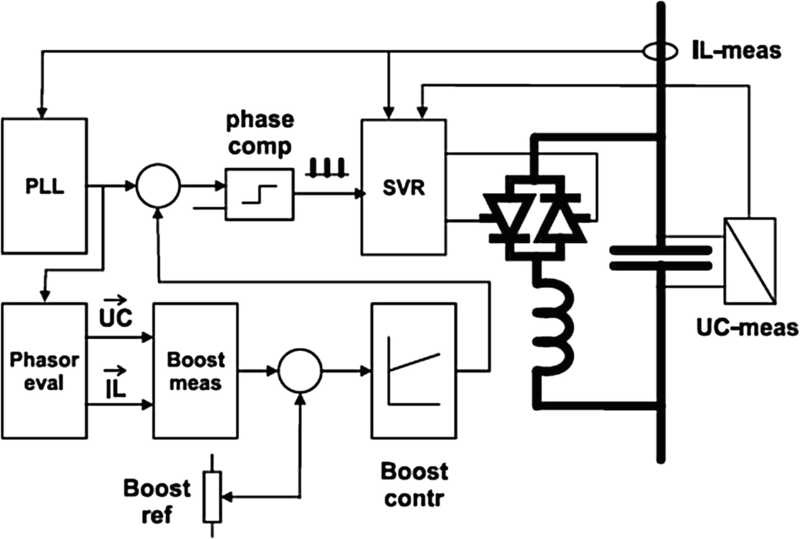 The phase C voltage exhibits the characteristic oscillations on a shunt reactor compensated line (Fig. 36). Figure 37 shows the current inflows into the staged fault from another line connected to the substation to which the TCSC is connected. Before the line was reclosed and the TCSC controller put back into operation, the series capacitor voltage, series capacitor current, and line current of phase C are all zero, and the line voltage of phase C was in an oscillatory state. When the line reclosing was successful, the TCSC returned to normal state. The 500 kV TCSC in the Fengtun substation improves the transient stability and the damping characteristics of the power transmission system from the Yimin Power Plant. 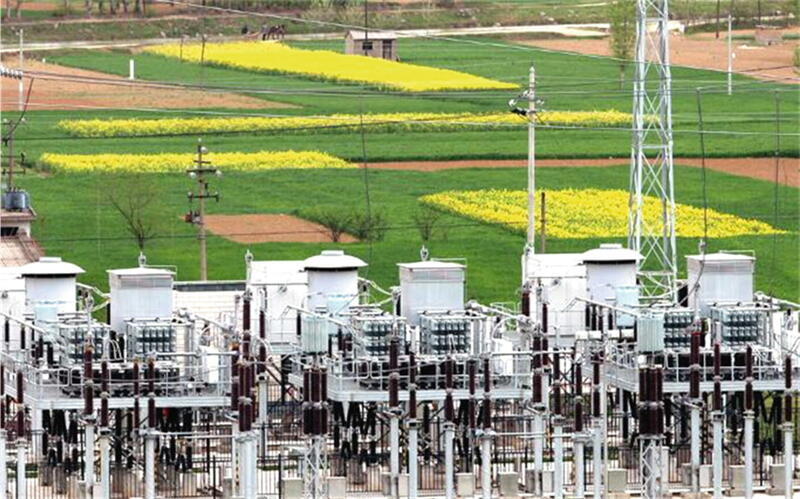 The power transmission capacity of the 500 kV lines from Yimin Power Plant to Fengtun substation was increased by 22.7%, which completely met the needed power transmission requirement and avoided construction of a new 500 kV transmission line across the forest region in the Xing’an Mountains, and therefore the ecological environment of the primeval forest in the Xing’an Mountains was protected. At the same time the TCSC suppresses subsynchronous resonance and low-frequency oscillation of the power system and controls the line power flow in the transmission system. After the six 600 MW generators and a 3000 MW HVDC transmission system were installed in the Hulunbeier area, some of the power from the HVDC transmission line is also transmitted through the 500 kV lines from the Yimin Power Plant to the Fengtun substation. The 500 kV TCSC Project in the Fengtun substation ensures the safe and stable operation of the ac-dc hybrid system in the Northeast China Grid. The losses of TCSC are difficult to measure in actual project, so it is generally obtained by calculations based on the component parameters in the TCSC. Taking the Fengtun TCSC as an example, the ratio of the controllable series compensation is 15%, the nominal capacity is 326.6Mvar (with booster factor 1.2), the rated current of the transmission line is 2.33 kA, the boost factor in continuous operation state is 1.2, and the series capacitor capacitance is 190.5 μF/phase. The inductance of TCR’s reactor is 9.1mH and reactor’s quality factor is 90. The long-term valve operating current (R.M.S) is 1.58kA and the long-term operating peak voltage of valve is 64.6kV. The losses of the TCSC device are primarily generated by its TCR branch, series capacitors, water cooling system and control and protection system. The losses of the capacitor bank are estimated as 0.02%; less than 100 kW. The power consumption of the water cooling system is generated by pump, fan, and the controller and is less than 100 kW. The power consumption of the control and protection system is generated by power supply; less than 10 kW. When the TCR branch is continuously operating with rated current, the loss of the valve is about 500 kW and the loss of the reactor is calculated from its long-term operating current and the reactor resistance, about 250 kW. In India electricity is a concurrent subject of Indian constitution, i.e., both Central and State Government are responsible for overall development of the electricity sector. The total installed generation capacity as of June 2018 in the country was 344 GW comprising about 65% thermal, 13% hydro, 20% renewable, and balance 2% nuclear sources. Out of the above installed capacity, about 85 GW capacity (25%) is in the central sector, 104 GW (30%) in the State sector, and the balance 155 GW (45%) in the private sector. Five regional grids, namely, Northern, Eastern, Western, North-eastern, and Southern Regions were synchronously interconnected with each other, with a transmission network consisting of 765/400/220 kV ac (about 379,425 circuit km) and HVDC (15,556 circuit km) systems. The total inter-regional capacity was 86,450 MW facilitating seamless flow of power across the regions. This might grow to be 118,000 MW by 2022. Power Grid Corporation of India Ltd. (POWERGRID), the Central Transmission Utility (CTU) mandated to develop the inter-state/inter-regional transmission system. In June 2018 it owned and operated about 148,838 circuit km (ckm) transmission lines and 326 EHV substations at 765 kV and 400 kV levels and ± 500 and ± 800 kV HVDC systems with transformation capacity of about 335,433 MVA traversing the length and breadth of the country. Indian National Grid also had cross border links with neighboring countries Bhutan, Nepal, Bangladesh, and Myanmar. The total cross border link capacity in 2018 was 2,550 MW, which might increase to 6,750 MW over a 3–4 year time period. There were 48 FSCs installed in the 400 kV/220 kV transmission lines and six TCSCs installed in 400 kV lines. These TCSCs have been installed on transmission lines in the inter-regional transmission corridors transferring bulk power from surplus Eastern/North Eastern Region to load centers in Northern and Western regions. Region wise distribution of FSCs and TCSCs are listed in Table 6. While series capacitor have been effective in improving transient and steady state stability, the requirement to increase the transmission capacity of the lines to their design limits necessitated additional requirements for damping of system oscillations. A TCSC adds another control dimension because the thyristors can be used to dynamically modulate the reactance of the inserted series capacitor. This is primarily used to provide damping of prospective low frequency electromechanical oscillations. Often the TCSC is combined with fixed series compensation in order to increase the transient stability in a cost effective way. The TCSCs installed in the Indian Power system are shown in Table 7. 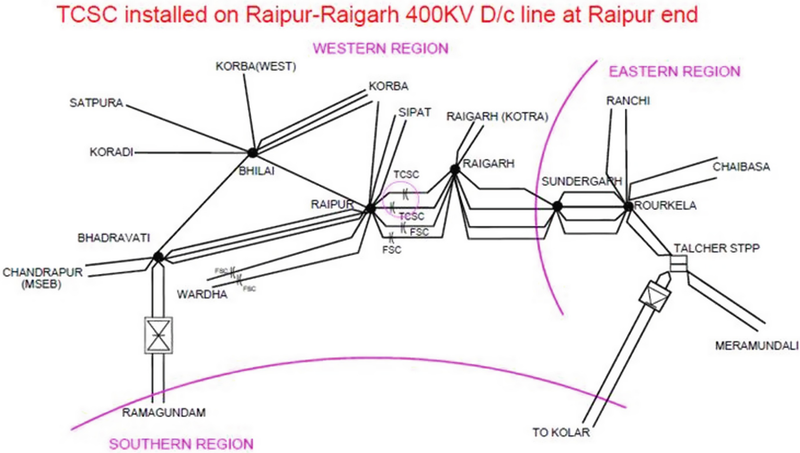 The location of the Rourkela–Raipur 400 kV D/c line is shown in Fig. 38. This line was later Looped In and Looped Out (LILO) at the Raigarh substation and was planned as an inter-regional interconnection line between the Western region and Eastern regions for facilitating export of energy from the Eastern to the Western Grid. To enhance the power transfer capacity of the line and maintain system stability, 40% fixed series compensation was also planned. However, as per the study, a low frequency (0.5 Hz), poorly damped interarea mode of oscillation was observed during contingency conditions. In order to solve the problem of sustained low frequency oscillations, installation of a 5 to 15% TCSC on the 400 kV line at Raipur end was therefore planned along with the 40% fixed series compensation (Grünbaum et al. 2006; Nayak et al. 2006). This TCSC installation, rated at 59 Mvar, was commissioned in 2004. It was the first commercial TCSC project in India and Asia. The TCSC was installed on each of the Rourkela–Raipur 400 kV D/c (Double Circuit) line and later LILO’ed. at the Raigarh substation. The continuous rated current of this system is 1550 A, the 30 min rating is about 2500 A, and the 10 min rating is 2790 A. At the 15% compensation level, the capacitive impedance is 20.5 ohms. For transfer of power from Tala hydro plant (1,020 MW) in Bhutan, 400 kV Tala–Siliguri–Purnea–Muzaffarpur–Gorakhpur (Quad) D/c transmission corridor was planned to interconnect the North-Eastern–Eastern and Northern regions. In order to enable high loadability of the line, 40% fixed series compensation systems on Purnea–Muzaffarpur and Muzaffarpur–Gorakhpur lines were planned. Dynamic analysis revealed that with series compensation alone, the system becomes transiently stable, but would experience sustained interarea low frequency (about 0.3 Hz) oscillations. 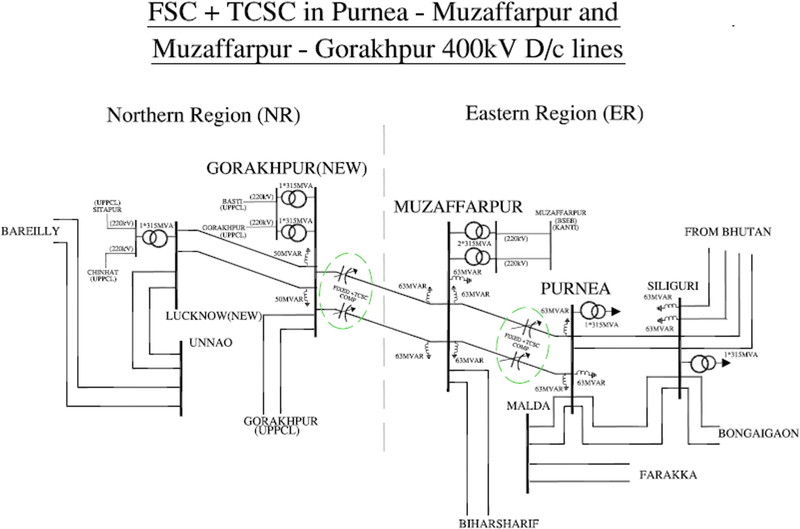 Accordingly, to damp out low frequency interarea oscillations, 5% to 15% TCSC were installed on both Purnea– Muzaffarpur (about 230 km) and Muzaffarpur–Gorakhpur line (about 410 km) sections along with 40% fixed series compensation on each section as shown in Fig. 39. In 2006, one 140 Mvar and one 135 Mvar TCSC system were installed at Purnea end and Gorakhpur end respectively, on the Purnea–Muzaffarpur–Gorakhpur 400 kV transmission corridor. The Gorakhpur installation is shown in Fig. 40. The purpose of the systems was to damp low frequency interarea oscillations. The degree of compensation could be varied between 5 and 15%. The continuous rated current is about 3,900 A, the 30 min rating about 5,300A, and the 10 min rating slightly less than 5,900 A. At the 15% compensation level, the capacitive impedance was about 9 ohms (Table 8). As part of a program of network updates between National Grid and Scottish Power, National Grid, UK, installed two TCSC systems to help boost the flow of power from Scotland to England over the existing 400 kV lines. Two identically 4,000 A, 6.83 Ω (395 MVA) rated TCSCs were, as illustrated in Fig. 41, installed at the Hutton 400 kV substation, near Kendal in Cumbria. The series compensation at Hutton 400 kV substation contributes to increase the transient stability limit of the 400 kV transmission corridor between Scotland and England up to the thermal limit of the transmission lines and allows considerable increase in power flow across the Anglo-Scottish border. The project was a part of the National Grid’s preparations for the UK electricity transmission network to meet the Government’s target for 15% of the UK’s energy to be produced from renewable energy sources by 2020. The report Our electricity transmission network: A vision for 2020 produced by the Electricity Networks Strategy Group (ENSG) (2009) studied transmission reinforcements necessary to allow the EU 2020 renewable target and longer-term energy goals to be achieved in an effective and efficient manner. It is recognized in the report that due to planning constraints and environmental concerns, traditional methods of enhancing system capacity can be difficult to achieve. Consequently, the use of new or previously unused technologies on the UK electricity transmission system had been investigated in order to optimize the use of existing assets and to provide new infrastructure with minimal environmental impact and acceptable technological risk. The series compensation equipment installed at the Hutton 400 kV substation uses thyristor control to increase the power flow, mitigate subsynchronous resonance, and ensure that the power supply system remains stable. The nominal degree of capacitive series compensation is equal to 35%. The boost factor of the TCSC systems is 1.2 per unit. The ABB TCSC is a FACTS controller providing capacitive apparent reactance at the fundamental grid frequency (in this case 50 Hz) and inductive apparent reactance in the critical subsynchronous frequency range. The TCSC comprises a controlled inductor in parallel with the capacitor bank, as shown in the single-line diagram in Fig. 42. The inductor is of air-core design, mounted on its own support insulators for full insulation to ground, i.e., the platform. 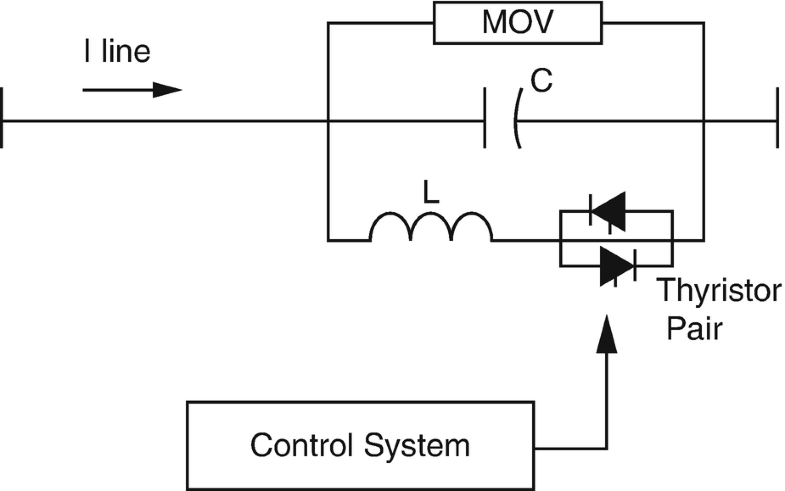 A MOV is connected across the capacitor bank to prevent capacitor and valve overvoltages. The thyristor valve contains strings of series connected high power thyristors. The thyristors are of the same type as used for SVCs. In this case, the thyristors are “indirect light triggered,” i.e., trigger pulses are transferred from ground potential to the thyristor electronics via optical fibers. For each thyristor position, there is a thyristor control unit (TCU) which receives firing pulses and sends back thyristor status pulses to the control system. The energy required to trigger the thyristors is fed from the main circuit. All communication between valve and control system is performed via fiber optic cables. Since the valves are placed in an outdoor enclosure and must survive ambient temperatures as low as minus 25 °C, the valve cooling system media is a mixture of glycol and water. Due to the location of nuclear power plants, there could be a potential risk of SSR if conventional fixed series capacitors without any SSR mitigation were installed in the transmission lines. For this reason, SSR damping was a major part of the TCSC system requirements. Today the SSR phenomenon is well understood; it can be predicted and counteracted as part of the series compensation system planning and design. Consequently, the use of a TCSC with a suitable control algorithm enables a transmission system free from conditions leading to SSR risks. To achieve SSR damping, the TCSCs utilize the Synchronous voltage reversal (SVR) control method (Ängquist 2002).2 The SVR control method forces the capacitor bank to reverse its voltage during the thyristor valve’s conduction interval. For the subsynchronous frequency range, i.e., the range of concern for SSR mitigation, it can be shown that using the SVR control principles the TCSC exhibits an inductive apparent impedance when the voltage reversals (when the polarity changes) are repeated with an equidistant time interval. Hence, the series capacitor is seen as an inductor by the transmission system for subsynchronous frequencies, and consequently, no series resonance can be created in the grid in the SSR range. It should be noted that these unique characteristics are obtained without the need for any measurement or acquisition of subsynchronous quantities within or outside the series capacitor. The SVR control function uses instantaneous measurement of the main line currents and the main capacitor voltages only. As an example, a Real Time Digital Simulator (RTDS) simulation of the Hutton TCSC installations is illustrated in Fig. 43. That is, the simulation shows that SSR should not be an issue for the Hutton TCSC systems incorporating the SVR control scheme. Limited performance information has been received from the operators of the existing TCSC systems (CIGRE TB 554, October 2013 and Nilsson 1998). All but one of the commercially procured systems are used for system damping applications. Some (notably the Chinese TCSC systems) also have as stated objectives to improve the transient stability of the ac system which generally means transfer as much synchronizing power as possible during the first power swing before enabling the damping controls. The Swedish system is purely for SSR control, but the SSR damping is also one objective for all of the TCSC systems that are a part of series compensated lines connected to steam turbine power plants. This is the case for the Fengtun TCSC system in China, the Hutton TCSC in the UK, and the systems in India. That is, SSR damping is an important consideration when installing TCSC systems in addition to serving to improve the stability of the system. System damping applications and transient stability improvements may be needed only for specific system contingencies. In that case, the TCSC system is installed as an insurance against some more severe system problems if or when that contingency situation arises. In other cases, the system would be unstable under normal operation conditions if the TCSC system is not installed and operating. In these cases, the ability to include self-checking in the TSCS design provides continuous availability information. That is, if the contingency arises when the availability of the TCSC system is required, the probability that the system will be operational is very high. In the case of a mechanically switched compensation system, the ability of the system to perform is unknown until the order to switch is given to the equipment. The experience gained from the TCSC installations is that such systems can be installed with relatively short lead times. This can be an advantage if the alternative is a new line since it can in some parts of the world take 10 to 12 years to build a new line if it is at all possible. The required life for operation of a TCSC system might not be as long as for other power system components because as the power system changes and growths over time, the system modes will change and the damping of the system will also change. Also, when more lines eventually are added, the transient stability limits will also change and most of the time for the better. Therefore, a TCSC system may not be needed beyond a 15 to 20 year time horizon. If this is known at the time when the TCSC system is procured, it might be possible to reduce the capital (initial) cost of the system. Published with permission from ABB. see ABB’s document Appl. Note_1JNS018335_Hutton TCSCs_LR. This is an ABB patented control concept.